"Model S" redirects here. For the fighter aircraft, see Curtiss Model S.
The Tesla Model S is an all-electric five-door liftback car, produced by Tesla, Inc., and introduced on June 22, 2012. The EPA official range for the 2017 Model S 100D, which is equipped with a 100 kWh (360 MJ) battery pack, is 335 miles (539 km), higher than any other electric car. The EPA rated the 2017 90D Model S's energy consumption at 3.096 miles per kWh (200.9 watt-hours per kilometer or 32.33 kWh/100 mi or 20.09 kWh/100 km) for a combined fuel economy of 104 miles per gallon gasoline equivalent (2.26 L/100 km or 125 mpg‑imp). In 2016, Tesla updated the design of the Model S to closely match that of the Model X. As of January 2019[update], the following versions are available: 100D and P100D. The Tesla Model S was the top selling plug-in electric car worldwide in 2015 and 2016, and by the end of 2018 continued to rank as the second most-sold electric car in history after the Nissan Leaf. The December 2017 Consumer Reports owner satisfaction survey had the Tesla Model S at the top. The Model S was styled by Franz von Holzhausen, who previously worked for Mazda North American Operations. The car was codenamed WhiteStar during research and preliminary development. It was officially announced in a press release on June 30, 2008. The prototype vehicle was displayed at a press conference on March 26, 2009. Exclusive premier of their Model S electric car was held at their Menlo Park store on April 8, 2009. In February 2008 it was reported that Tesla, Inc. (then Tesla Motors) was planning to offer a range-extended version of its Model S. This version would have included a gasoline engine to extend the driving range of the vehicle, but it was removed in later revisions. At the GoingGreen conference in September 2008 Tesla's CEO, Elon Musk, announced that Tesla was developing only electric cars. Construction of an assembly factory in Albuquerque, New Mexico (a central location for shipping) was supposed to begin in April 2007, but was cancelled. A factory to be built in San Jose, California was also announced. In May 2010 Tesla announced it would produce the Model S at the former NUMMI assembly plant in Fremont, California, now known as the Tesla Factory. This third plan was implemented. The Tesla Model S was the 2013 World Green Car of the Year, 2013 Motor Trend Car of the Year, Automobile magazine's 2013 Car of the Year, Time Magazine's Best 25 Inventions of the Year 2012, and Consumer Reports' top-scoring car in road testing. In 2015, Car and Driver named the Model S the Car of the Century. After not recommending the Model S in 2015 due to poor reliability, one year later, Consumer Reports added the car to its recommended list. Tesla said that after three years (by June 2015), Model S cars traveled over 1 billion miles (1.6 billion km), the first plug-in electric car to reach that total. In 2014 the Volt total was 629 million all-electric miles (1 billion km) out of a total of 1 billion miles traveled, while Nissan said the Leaf had accumulated 625 million total miles. Tesla said 68% of Model S travel was in North America, 25% in Europe and 7% in Asia-Pacific. Global Model S sales passed the 100,000 units in 2015, and the 150,000 mark in November 2016. The 200,000 milestone was achieved by early in the fourth quarter of 2017. In 2016, the "Electric GT World Series" was promoted in preparation for a 2017 racing season using the P85+ as a race car on certain traditional tracks. The first season is planned to have 20 cars in 10 teams. In April 2016, Tesla made minor changes in the Model S. The front fascia has a similar design as the Model X, adding adaptive LED headlights. A HEPA cabin air filtration system was added. The standard charger increased from 40 to 48 amps, speeding charging at higher-amperage outlets. Two ash wood interior options were added. In May 2018 Tesla released source code for the Model S on a github.com repository as part of their software license compliance process in collaboration with the Software Freedom Conservancy. Tesla manufactures the Model S at the 5,400,000 square feet (500,000 m2) Tesla Factory in Fremont, California. For the European market, Tesla assembles and distributes from its European Distribution Center in Tilburg, the Netherlands. Cars are built and tested in Fremont, California. The battery pack, the electric motor and parts are disassembled and shipped separately to Tilburg, where the cars are reassembled. The center occupies a 203,000 sq ft (18,900 m2) industrial building that also serves as a workshop and spare parts warehouse. Tesla expects the Model S to "pay back" the energy that went into producing the car in fewer than 10,000 miles (16,000 km). The first ten customers received their cars at the Fremont factory on June 22, 2012 at the official launch. Production grew from 15–20 cars completed per week in August 2012 to about 1,000 cars per week in 2015. In October 2015, Tesla announced the company is negotiating with the Chinese government on producing its electric cars domestically. Local production has the potential to reduce the sales prices of Tesla models by a third. Agreement for a production facility with capacity for up to 500,000 vehicles was formally announced in July 2018. The Model S exists in several versions, differing in energy capacity (battery size), power (motor size), and equipment. It is classified as a full-size luxury car in the US, or as a "Large Car" (120 cu ft or more) or "Luxury Sedan" by the EPA. The Euro Car Segment classification is S-segment (sports car), or "Oberklasse" (F-segment) in Germany. Model S P85+ using regenerative braking power in excess of 60 kW. During regenerative braking, the power indicator is green. The 2012 Tesla Model S Performance model has a three-phase, four-pole AC induction 416 hp (310 kW) and 443 ft⋅lb (601 N⋅m) rear-mounted electric motor with copper rotor. The base model uses a 362 hp (270 kW) and 325 ft⋅lb (441 N⋅m) motor. The company claimed a drag coefficient of Cd=0.24, lower than any other production car when released. Independent measurement by Car And Driver in May 2014 bore out Tesla's claim by exactly confirming a drag coefficient of Cd=0.24. The rear axle has a traditional open differential. Models with dual motors also have an open differential on the front axles as well. The front and rear axles have no mechanical linkage – with dual motors, the power distribution among them is controlled electronically. The Model S P90D has a top speed of 155 mph (249 km/h) and it can accelerate from 0 to 60 miles per hour (0 to 97 km/h) in 2.8 seconds, despite the lower total motor power, in part due to the improved traction of the all-wheel drive powertrain. The Model S P85D, a dual-motor all-wheel-drive vehicle has a governed top speed of 155 mph (249 km/h) and it accelerates from 0 to 60 miles per hour (0 to 97 km/h) in 3.2 seconds (tested to 3.1 seconds), under "Insane Mode", with 1g of acceleration. New P85Ds have an optional "Ludicrous Mode" hardware package available with the 90 kWh battery upgrade (thus becoming a P90D) that improves the 0 to 60 miles per hour (0 to 97 km/h) acceleration to 2.8 seconds and 1.1g. Tesla initially reported the total output in the P85D as the arithmetic addition of the maximum power of the individual electric motors at 691 hp (515 kW) but later reported it as 463 hp (345 kW) because the two motors do not give their maximum power at the same time. As of March 2017, the P100D variant holds the record for the fastest acceleration of any production vehicle with a NHRA rolling start to 60 mph in Motor Trend tests with 2.28 seconds (0 to 100 km/h in 2.36 seconds) in ludicrous mode, although other independent tests have placed it behind the Porsche 918 Spyder. Owing to overheating issues, Tesla limits the number of times that a driver is able to use ludicrous mode within a certain amount of time, as driving the car in that mode may shorten the battery's lifespan and can cause damage to the car. According to Motor Trend, selecting the "Yes, bring it on!" option for maximum acceleration "initiates a process of battery and motor conditioning, wherein the battery temperature is raised slightly and the motors are cooled using the air-conditioning system. It usually takes just a few minutes, longer in extreme ambient temperatures or after repeated runs. You should expect to wait a minimum of 10 minutes in-between runs." The powertrain provides regenerative braking power of more than 60 kW, which both reduces energy consumption and improves brake lifetime. Owners reported many powertrain issues from 2012, improving significantly over the years. In July 2015, Tesla announced its goal to make the Model S powertrain last for one million miles. By 2017, in the Consumer Reports Car Reliability Survey, Tesla's position on the list had moved up four spots; the predicted reliability rating for Model S reached "above average" for the first time. On October 9, 2014, Tesla announced the introduction of All-Wheel Drive (AWD) versions of the Model S's 60, 85, and P85 models, designated by a D at the end of the model number. On April 8, 2015, Tesla introduced the Model S 70D as its new entry-level car, with all-wheel drive and an improved range of 240 miles (385 km). The 70D replaced the 60 and 60D in the Model S lineup, with the latter two models no longer being available for purchase. The P85 option was also dropped. In the 85D, the rear drive unit is replaced by a smaller one to save on cost and weight, while a second motor of similar size is added to the front wheels. This results in an AWD car with comparable power and acceleration to the Rear Wheel Drive (RWD) version. Additionally, Tesla said the 85D has a 2% (5-mile) range increase and 11% increase in top speed over the 85. In the P85D, the high-power rear drive unit is retained, while a new front drive motor boosts the total power by about 50%. This results in a significant increase in acceleration and top speed. Deliveries of the P85D started in December 2014, with the 85D models starting in February 2015, and the 70D models starting in April 2015. On June 9, 2016, Tesla reintroduced the 60 and 60D, which has a 75 kWh battery, software locked to 60 kWh and there is an option to purchase an unlock for the 75 kWh capacity. The early 2016 refresh also offers the "Bioweapon Defense Mode" air filter first offered on the Model X. On August 23, 2016, Tesla introduced the Model S P100D with ludicrous mode as its new top-level car, with all-wheel drive and an improved EPA estimated range of 315 mi (507 km). This version of the Model S is notable for being the first electric vehicle to have an EPA estimated range greater than 300 miles (485 km) and for being the fastest accelerating vehicle currently in production, with a 0–60 mph (0–97 km/h) time of 2.5 seconds, when optioned with ludicrous mode. On April 16, 2017, Tesla removed the model 60 and 60D options, since most customers pick the larger 75-kwh battery option. 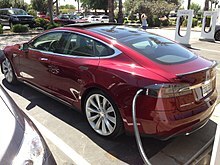 This made the Model S 75 the entry-level Model S.
In early 2019, Tesla removed all rear-wheel drive options and started offering only all-wheel drive versions of the Model S.
The energy-saving sleep state powers off the display and other vehicle electronics, after the car goes to sleep. This increases the time it takes the touchscreen and instrument panel to become usable. This mode can decrease the loss of the car's range when not being used to 2.3 mi (3.7 km) per day, as of 2013[update]. The 85 kWh battery pack weighs 1,200 lb (540 kg)[better source needed] and contains 7,104 lithium-ion battery cells in 16 modules wired in series (14 in the flat section and two stacked on the front). Each module contains 6 groups of 74 cells wired in parallel; the 6 groups are then wired in series within the module. As of June 2012[update], the battery pack used modified Panasonic cells with nickel-cobalt-aluminum cathodes. Each cell was of the 18650 form factor (i.e., an 18 mm diameter, 65 mm height cylinder), similar to the Panasonic NCR18650B cell that has an energy density of 265 Wh/kg. Analysts estimate battery cost to be around 21–22% of the car cost. Lithium-ion batteries operate best at certain temperatures. The Model S motor, controller and battery temperatures are controlled by a liquid cooling/heating circuit. Waste heat from the motor heats the battery in cold conditions, and battery performance is reduced until a suitable battery temperature is reached. The battery is guaranteed for eight years or 125,000 miles (200,000 km in metric countries) for the base model with the 60 kWh battery pack. The 85 kWh battery pack is guaranteed for eight years and unlimited miles. A poll among drivers indicate that accumulated battery loss steadies around 5% after 30,000 miles (50,000 km), decreasing further about 1% per additional 30,000 miles (50,000 km). Unlike Nissan, Tesla does not specify a limit for battery loss, but some early battery packs have been replaced. A separate battery replacement guarantee takes effect after the eighth year for the 60 kWh and 85 kWh batteries. In 2013, Tesla canceled a 40 kWh version of the car due to lack of demand, saying that only 4% of pre-orders were for the 40 kWh battery option. Customers who ordered this option instead received the 60 kWh pack, with charge software-limited to 40 kWh (139 miles, 224 km). It has the improved acceleration and top speed of the bigger pack and can be upgraded to use the full 60 kWh. On April 8, 2015, Tesla discontinued the Model S 60, and replaced the base model with the Model S 70. In 2015, Tesla introduced a 70 kWh battery to replace the existing 60 kWh batteries and base 60 kWh Model S vehicles, as the 60 was low margin and not sufficiently welcomed by customers. All 70 kWh cars can be had with rear-wheel drive or all wheel drive. The 60 was re-introduced in 2016 as a software-limited 75, upgradable to 75. In July 2015, Tesla introduced its 70, 90, 90D and P90D variants along with a "ludicrous mode" for the performance model. The P90D combines a front axle power of 259 horsepower (193 kW) and rear axle power of 503 horsepower (375 kW) for a 0–60 mph time of 2.8 seconds. The acceleration of the P90D can reach 1.1g, described by Tesla as "faster than falling". Tesla described its July 2015 introduction of the 90 kWh battery as a "range upgrade" of the 85 kWh battery and explained that the 6% energy increase was due to "improved cell chemistry" and the introduction of silicon into the cell's graphite anode. Tesla additionally announced its expectation of an annual improvement in battery capacity of about 5%. Tesla also explained that apart from the P90D the Model S has its main battery conductor protected by a fuse rated for 1,300 A and that this rating is somewhat conservative given the uncertainty of the exact conditions under which a fuse melts. To reduce this uncertainty Tesla has for the P90D introduced Inconel battery contactors and an electronically controlled pyro-activated fuse, which monitors the current at the millisecond level, cuts the power with "extreme precision and certainty" and has a rating of 1,500 A. In February 2016, the 85 kWh battery option was discontinued in countries including the US, Australia and Canada. In March 2016, media reported that a firmware version distributed for the Tesla Model S had support for a P100D variant that was yet to come. This battery is more complicated to make than the 90 version. The P100D was released in August 2016. In April 2017, Tesla ceased offering the 60 kWh software limited battery option. The lowest capacity option became the 75 kWh, and at the same time Tesla significantly reduced the software upgrade options for facelifted 60 and 70 models to be upgraded over-the-air to 75 (and rebadged at their next visit to a Tesla service centre). In January 2019, Tesla discontinued the 75 kWh battery option, leaving two possible configurations with the 100 kWh battery pack as the 100D and the P100D. The Model S is notable for being designed solely with an electric powertrain in mind, unlike other vehicles where the manufacturer has simply swapped out or supplanted an internal combustion engine with an electric motor. As a result, the Model S is able to offer unique features such as a front trunk (a 'frunk') in addition to a spacious rear trunk (with a total cargo volume of 31.56 cu ft (894 L)) (rear wheel drive version has bigger frunk) and a greatly enlarged front crumple zone compared to the typical combustion engine powered vehicle. To enhance livability, Tesla has developed a network of fast-charging 'Supercharger' stations that allow the driver to quickly and easily top-up the charge on their Model S. A Supercharger takes about 20 minutes to charge to 50%, 40 minutes to charge to 80%, and 75 minutes to 100% on the original 85 kWh Model S. Supercharger networks have rapidly expanded in Europe, across the United States, and in other countries where there is significant demand, and as of September 2016[update], the network has been established in most American states, thus making cross-country and long distance trips in an electric vehicle feasible and greatly alleviating fears of range anxiety. Researchers from the University of California, Davis conducted a study to identify the factors influencing the decision to adopt high-end battery electric vehicles (BEV), such as the Tesla Model S, as these vehicles are remarkably different from mainstream BEVs. The 2016 study found that "environmental, performance, and technological motivations are reasons for adoption; the new technology brings a new segment of buyers into the market; and financial purchase incentives are not important in the consumer's decision to adopt a high-end BEV." ^ Original stated 40 kWh model specifications. Range limited 60 kWh versions actually delivered. ^ a b c Only available for Dual-Motor Performance models with optional Ludicrous Mode upgrade, which requires 90 kWh battery for new cars (P90D). Only available until January 2016 for P85D already in ownership. ^ a b c d e Total motor power specification, battery power limited to less. ^ Tesla subtracts "one foot rollout" from acceleration times. Under its five-cycle testing protocol, the United States Environmental Protection Agency (EPA) rated the 90 kWh Model S model with a combined fuel economy equivalent of 104 MPGe (2.26 L/100 km or 125 mpg‑imp), with an equivalent 102 mpg‑US (2.3 L/100 km; 122 mpg‑imp) in city driving and 107 mpg‑US (2.2 L/100 km; 129 mpg‑imp) on highways. The following table shows the EPA's official ratings for fuel economy in miles per gallon gasoline equivalent (MPGe). In contrast to most earlier battery electric vehicles including the Roadster, the battery pack of the Model S forms the floor of the vehicle between the axles, providing the vehicle with several advantages. Most notably, since the battery pack is the heaviest component of the vehicle, the Model S has a center of gravity height of only 18 inches (46 cm) (about the same as a Lotus Elise), helping it to achieve a lateral acceleration of 0.9g and good protection against rollover. Secondly, the absence of a heavy engine between the front or rear axle allows the bulk of the mass to be centralized between the axles, lowering rotational inertia allowing it to turn more quickly for its weight. Thirdly, the placement of the battery pack increases the rigidity of the passenger compartment, improving the passive safety of the vehicle. Fourth, placing the battery pack under the vehicle makes it possible to remove or replace the entire unit in 90 seconds for maintenance. Universal Mobile Connector (UMC) intermediate connector allowing the use of different adaptor plugs. Europe/Rest of World (left) and North America (right). In all markets the charge port is located behind a door in the left taillight. During charging, the charge port pulses green. The frequency at which the charge port's light pulses slows down as the charge level approaches full. When charging is complete, the light stops pulsing and is solid green. The Model S comes equipped with a different charger and connector in North American versus other markets, derived from differences in the local electric grid systems. The standard North American onboard charger accepts single phase 120 or 240 volt sources at a rate of up to 10 kW. Included adapters allow the car to charge from a standard 120 volt outlet, a 240 volt NEMA 14-50 outlet, a 208 volt leg to leg of a 208Y/120 V 3-phase configuration, a 277 volt leg to neutral of a 480Y/277 V 3-phase configuration and SAE J1772 public chargers. An optional upgrade for a second 10 kW onboard charger supports a total of up to 20 kW charging from an 80 amp available Tesla Wall Connector. The North American connector uses a proprietary Tesla design. Charging times vary depending on the battery pack's state-of-charge, its overall capacity, the available voltage, and the available circuit breaker amperage. From a 120 volt/15 amp household outlet, the range increases by 3.75 miles (6 km) for every hour of charging. From a 10 kW, NEMA 14–50 240 V/50 A outlet (like those used by RVs or standard cooking ranges), the charge rate is 28.75 miles (46 km) per hour. Using Tesla's 20 kW, 240 V High Power Wall Connector increases the rate to 57 miles (92 km) per hour if the car is configured with dual chargers (20 kW). The standard European charger accepts single phase 230 V at up to 7.6 KW, three phase 230 V (400 V) at up to 11 KW. The Type 2 connector on the car directly accepts "Mennekes" IEC 62196 charging from public stations at up to 400 V, and included adapters allow the car to charge from standard continental European outlets and IEC 60309 230 volt (blue 3-pin) or 400 volt (red 5-pin) outlets, depending on region. The addition of a second charger supports charging at up to 22 kW (up to 16.5 kW with new charger for 3 phase 400 V 24 A on new front fascia Model S), providing up to 68 mi (110 km) (50 mi (80 km) on new front fascia Model S) of range per hour of charge. The Model S has independent coil spring suspension on all four wheels – front double wishbone, virtual steer axis control arm and rear independent multilink. As an extra-cost option, the car is available with self-leveling, height-adjustable air suspension. This is accomplished via adjustable Bilstein shock absorbers controlled by the driver. The car is meant to lower itself at highway speed and raise itself to traverse steep driveways and rough terrain, despite the low 6 inches (15.2 cm) ground clearance and rather long 116 inches (294.6 cm) wheelbase. Because, in the Tesla, electronic systems can be upgraded by "over-the-air" download, rather than recall, the suspension system has been changed retroactively on several occasions. During the 2013 'fire investigation', NHTSA asked Tesla to disable the car's ability to lower itself at speed on the theory that a ground clearance below 6 inches (15 cm) might cause the batteries underneath the car to contact road debris. In September 2014, Tesla upgraded the height adjustment feature for Model S cars equipped with air suspension to remember locations that require higher clearance such as those with potholes and steep driveways, and automatically adjusts to avoid them. Beginning in September 2014, Model S vehicles come equipped with a camera (supplied by Mobileye) mounted at the top of the windshield, forward looking radar (supplied by Bosch) in the lower grille, and ultrasonic acoustic location sensors in the front and rear bumpers that provide a 360-degree buffer zone around the car. This equipment allows Model S to detect road signs, lane markings, obstacles, and other vehicles. In addition to adaptive cruise control and lane centering, a "Tech Package", together known as Autopilot, option enables semi-autonomous drive and parking capabilities. All Model S cars sold since October 2014 have the option to enable Autopilot, which allows limited hands-free driving. Autopilot-enabled cars receive software wirelessly, the same as other car software updates. According to Elon Musk, the Model S was designed to be a computer on wheels: "We really designed the Model S to be a very sophisticated computer on wheels. Tesla is a software company as much as it is a hardware company. A huge part of what Tesla is, is a Silicon Valley software company. We view this the same as updating your phone or your laptop." Full autonomy is "really a software limitation: The hardware exists to create full autonomy, so it's really about developing advanced, narrow AI for the car to operate on." The first known fatal accident involving a Model S when Autopilot was active occurred in Williston, Florida on May 7, 2016. In June 2016, the U.S. National Highway Traffic Safety Administration (NHTSA) opened a formal investigation into the accident, working with the Florida Highway Patrol. According to the NHTSA, preliminary reports indicate the crash occurred when a tractor-trailer made a left turn in front of the Tesla at an intersection on a non-controlled access highway, and the car failed to apply the brakes. The NHTSA's preliminary evaluation was opened to examine the design and performance of any automated driving systems in use at the time of the crash, which involves a population of an estimated 25,000 Model S cars. According to Tesla, "neither autopilot nor the driver noticed the white side of the tractor-trailer against a brightly lit sky, so the brake was not applied." The car attempted to drive full speed under the trailer, "with the bottom of the trailer impacting the windshield of the Model S." Tesla also stated that this was Tesla's first known Autopilot-related death in over 130 million miles (208 million km) driven by its customers while Autopilot was activated. According to Tesla there is a fatality every 94 million miles (150 million km) among all type of vehicles in the U.S. In January 2017, the NTSB report concluded Tesla was not at fault since the driver in the crash had seven seconds to see the truck and take action; the investigation revealed that the Tesla car crash rate dropped by 40 percent after autopilot was installed. The instrument panel is a 12.3-inch (31 cm) liquid-crystal display electronic instrument cluster that indicates speed, power usage, charge level, estimated range and active gear, as well as navigation directions (driven by Garmin). The gear selector can be set to drive, neutral, reverse, and park. The infotainment control touchscreen is a 17-inch (43 cm) multi-touch panel divided into four areas. A top line displays status symbols and provides shortcuts to Charging, HomeLink, Driver Profiles, vehicle information (software version and the vehicle identification number) and Bluetooth. The second line provides access to several apps including Media, Nav (driven by Google Maps, and thus is separate from the navigation on instrument panel), Energy, Web, Camera and Phone. The central main viewing area displays the (two) active apps, subdivided into upper and lower areas. (Most apps can be expanded to take up the entire area). At the bottom is access to various controls and settings for the vehicle such as doors, locks and lights as well as temperature controls and a secondary volume control. The instrument cluster and the infotainment panel are driven by separate Nvidia Tegra 3 3D Visual Computing Modules until mid 2018. Tesla was the first company to ship this technology. The Tegra system on a chip (SoC) integrates eight specialized processors, including a multi-core ARM CPU, a GPU, and dedicated audio, video and image processors. Nvidia claimed that it consumes 2% of the energy of a typical CPU. The navigation system uses GPS and a mix of Garmin and Google Maps route guidance. The map display on the 17 inches (43 cm) screen requires a constant Internet connection, so navigation is limited in areas without mobile network coverage. The Nav on the instrument panel is loaded on the car and does not need Internet access to function. Update 6.2 features automatic navigation guidance to charging stations if range is insufficient. Enthusiasts have developed the Open Vehicle Monitoring System (OVMS) which allows the owner to remotely observe a variety of different vehicle operating parameters, such as battery state of charge, typically using a smartphone. Some switchgear used are Mercedes parts, such as window switches, cruise control lever, and drive selector. According to Elon Musk, the Model S runs on the open-source Linux operating system. 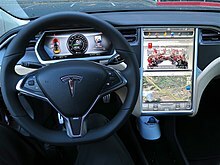 In 2014, Autoblog reported that Tesla Models S owners had determined via the car's combined diagnostics and Ethernet port that a Ubuntu system controlling the central touchscreen is connected to the car's internal Ethernet. The same users determined that another Ubuntu system controlling the dashboard/navigation screen also is connected to the internal network, together with a third computer of unknown type with an unknown function. All versions of the Model S have the same body and normally seat five passengers. A four passenger version with executive rear seats was an option briefly in 2015 in the United States; other locations may still offer this option. An optional folding third row becomes a rear-facing two-place child seat with a five-point harness. Consumer Reports said that the 7-passenger capacity afforded by this option is larger than any other electric vehicle, though not really the same as a full-size SUV that seats 7 adults. The two extra seats are only for children over 37 in (940 mm) tall and weighing between 35 to 77 lb (16 to 35 kg), which the magazine described as "a narrow size range. It's too big for smaller kids, and larger ones won't fit under the sloping glass window." The seats fold away under the rear cargo area, which Consumer Reports said is a "cumbersome and awkward" operation, though for the third row seats are "useful for occasional extra passengers when your kids bring friends along", provided the driver had planned ahead and left the cargo area empty. Though the rear-seat option includes a stronger rear bumper, the magazine also said that seating behind the rear axle on the Model S, like any third-row seat, is an additional risk in severe rear impacts, though these are relatively rare. Cargo space is available under the front hood, which Tesla calls the "frunk". In October 2014, the upgraded Model S P85D, D for dual, was introduced. The upgraded version has two electric motors, one driving the rear wheels as in prior versions, and one driving the front wheels. The dual motor version will be available also for the basic 85 kWh versions. The rear wheel drive version of the P85 was removed, and the dual motor option is not available for the 60 kWh version. The 2015 model year update introduced electromechanical brakes. In 2016, the 85 kWh and later 90 kWh battery was discontinued from all markets. A glass roof with no horizontal roof bar between the B-pillars was introduced in late 2016. Before adding an all-glass roof option for the Model S, possible roof options were: body colored roof, a black painted roof, or the panoramic sunroof. The Model S is covered by a 4-year, 50,000 mi (80,000 km) limited warranty, that includes all standard equipment, the transmission and the complete powertrain (excluding tires). The warranty can be extended an additional 4 years or 50,000 miles (80,000 km) beyond the original terms. Warranty coverage includes a complementary loaner car—a Performance 85 or Tesla Roadster—when service is required. In April 2013, Tesla announced that a previously mandatory annual vehicle inspection and maintenance fee would be made optional, and would not be required to maintain warranty coverage. If chosen, the fee covers a complete inspection, tire alignment, new brake pads, hardware upgrades and miscellaneous other maintenance items as needed. Tesla's lithium-ion batteries contain small amounts of nickel and cobalt, the extraction and refining of which has been identified by the EPA as having a high potential for environmental impact due to the toxicity of the refining processes. Tesla claims to recycle all the battery packs that are returned to the company, and is optimistic that its Gigafactory 1, once fully operational, will be capable of recycling a significant part of the elements from old batteries, approaching a "closed loop" in which old batteries are turned into new batteries. Tesla has worked with ToxCo/Kinsbursky in the US since 2008 and Umicore in Europe to recycle worn out RoHS batteries, which will be performed at the new factory. While ToxCo/Kinsbursky uses a hydro-metallurgical process to recover lithium from the battery, Umicore only recovers nickel and cobalt for reuse in new batteries and turns approximately 30% of the battery, including the battery's lithium, into slag that is sold to steel refiners and cement manufacturers. In February 2014, the Automotive Science Group (ASG) published the result of a study conducted to assess the life-cycle of over 1,300 automobiles across nine categories sold in North America. The study ranked the Model S as the best environmental performer in the 2014 full-size cars category. Based on the assessment of life-cycle environmental footprint, the study concluded that the increased environmental impacts of manufacturing the vehicle are more than offset with increased environmental performance during operation. For the assessment, the study used the average electricity mix of the U.S. grid in 2014. The Nissan Leaf had the smallest life-cycle environmental footprint of any model year 2014 automobile available in the North American market. The Automotive Service Group is an advertising-supported website and marketing consulting company founded by a Seattle couple in 2009. In 2012, a study by the Union of Concerned Scientists found that an electric vehicle in the United States with similar efficiency to the Model S is responsible for the production of the same amount of CO2 as a gasoline-powered car that gets 34 to 115 MPG, depending on the source of electricity in the region in which the car is being charged. The study estimated that nearly half of Americans lived in regions where an electric vehicle would result in less emissions than a 50 MPG hybrid vehicle. A 2015 study by Union of Concerned Scientists found that in the US regions where the Model S is popular, the 68% higher manufacturing emissions are offset within a few years of average driving. During their lifecycle, EVs emit about half the amount of comparable fossil cars. The report assumes electric materials are recycled at a rate similar to other cars, but excludes the problem of battery disposal, "because there are sparse data on how industry is currently recycling batteries or intends to do so in the future". Tesla recommends that the primary method of charging be overnight charging at home, "just like your mobile phone". Tesla Model S vehicles come with the Mobile Connector, which allows charging at up to 40 amps and includes adapters for connecting to a variety of electricity sources. In North America, adapters for 120 volt NEMA 5-15 and 240 volt NEMA 14-50 outlets, as well as an adapter for SAE J1772 charging stations, are included. In Europe, adapters for CEE red 3P+N+E, CEE blue 2P+E, CEE 7, and BS 1363 are available (inclusion varies by country), and an adapter cable for connecting to chargers with a Type 2 connector is also included. The Tesla Wall Connector is available for installation at a home or business, and it allows charging at up to 19.2 kW in North America and 22 kW in Europe (although charging the vehicle at 11.5 kW requires the High Amperage Charger option on the vehicle). The Tesla Destination charging network is a network of businesses that have installed Tesla Wall Connectors. These units are provided to the businesses by Tesla for free or at a heavily discounted price, although the business is responsible for the cost of electricity. As of April 2017[update], over 5,000 businesses were participating in the program, and Tesla plans to increase that number to 15,000 by the end of 2017. Not all destination chargers are available to the public, as some businesses limit them to customers or residents only. Tesla vehicles are also able to utilize public charging stations using the SAE J1772, Type 2, and CHAdeMO charging standards via adapters. SAE J1772 and Type 2 adapters are included in the appropriate regions, while the CHAdeMO adapter is available for purchase. In 2012, Tesla began building a network of 480-volt charging stations, called Tesla Superchargers, to facilitate long-distance travel. As of June 2017[update], 861 Supercharger stations, with 5,655 chargers, were operating worldwide, and Tesla planned to have 10,000 chargers installed by the end of 2017. The Tesla network is usable only by Tesla vehicles, which are engineered for compatibility. The Supercharger is a proprietary DC rapid-charging station that provides up to 145 kW of power, giving 85 kWh vehicles an additional 180 mi (290 km) of range in about 15–30 minutes. Older 60 kWh models may have a reduced charge rate. Along the West Coast corridor, the Superchargers's grid access is assisted by a solar carport system (some including a battery of a few hundred kWh) provided by SolarCity. All Tesla Supercharger stations were originally planned to be assisted by solar power. Supercharging hardware is a standard on all vehicles sold by Tesla except the original Roadster. In November 2013, Tesla reported that 90% of its customers had opted for supercharging capability. As of April 2016[update], there are over 620 operating Superchargers around the world. Elon Musk said at the unveiling of the Model 3 that that number would be doubled by the end of 2017. Tesla built 120-kW Tesla supercharger stations to allow long distance travel in North America, Europe, Asia, and Australia. A Supercharger can add up to 125 miles (201 km) of range in 20 minutes and a full charge in approximately one hour assuming a nearly empty 85 kWh battery. Supercharging hardware and usage is included in all Model S cars except the 60 kWh model, which had its supercharging disabled by software; a customer had to pay an extra fee to enable supercharging. The first Supercharger corridor opened in October 2012, with six stations placed along routes connecting San Francisco, Lake Tahoe, Los Angeles and Las Vegas. A second corridor opened in December 2012 connecting Washington, D.C., New York City, and Boston; it includes three stations located in highway rest areas in Delaware and Connecticut. The first Tesla Superchargers in Europe opened in Norway in August 2013. Tesla next focused on Germany and the Netherlands, which were covered by mid-2014. Switzerland, Belgium, Austria, Denmark and Luxembourg were covered by the end of 2014. Stations are planned to be within 200 mi (320 km) for about 90% of the population in France, England, Wales and Sweden by the end of 2014. Tesla designed the Model S to allow fast battery swapping, which also facilitates vehicle assembly. At a demonstration Tesla showed a battery swap operation taking around 90 seconds, about half the time it takes to refill an empty fuel tank. In June 2013, Tesla announced plans to deploy Tesla stations, with facilities to support battery pack swaps, although by June 2015 Tesla said that it was unlikely that more battery swap stations would be added. Battery swapping was planned to be deployed along Interstate 5 in California between San Francisco to Los Angeles, followed by the Washington, D.C. to Boston corridor. Each swapping station costs US$500,000 and stocks about 50 batteries. Owners can pick up their original battery pack fully charged on the return trip, which is included in the swap fee. Tesla's only battery swap station is located at Harris Ranch near Selma, California, and was available for pilot testing in late December 2014. As of 2015[update], Tesla says they have hundreds of cars in the battery swap program, although few owners were interested in using the service. In June 2015, Tesla said that it was unlikely that more battery swap stations would be added due to lack of demand for swapping. Tesla allocated the first 1,000 units to its Signature and Signature Performance limited edition configurations, equipped with the 85 kWh battery pack. Tesla does not make a convertible Model S.
A custom Model S was designed for the Oceanic Preservation Society in collaboration with Obscura Digital, and was used to project images of endangered animals to help educate the public about the ongoing Holocene mass extinction, as featured in the 2015 documentary Racing Extinction. Tesla reported 520 reservations for the Model S during the first week they were available and by December 2012, a total 15,000 net reservations (after deliveries and cancellations) had been received by year-end. The special edition Model S Signature model was sold out before deliveries began in June 2012, and according to Tesla all models were sold out for that year shortly after. A car ordered in May 2012 would be delivered in early to mid-2013. Initially Tesla expected its annual production to increase by over 50% in 2014 to 35,000 units, but in November 2014 reduced its sales target to 33,000 units due to a deficit in production of 2,000 units during the third quarter of 2014. The company expected its annual production to increase another 50% in 2015. Tesla set a target of between 50,000 and 52,000 deliveries for Model S and Model X cars in 2015, and delivered 50,658 units. Tesla sold more than 50,000 Model S cars globally in 2016, making it the world's top selling plug-in electric that year. In 2017, it became only the second EV to sell more than 200,000 units behind the Nissan Leaf. U.S. deliveries began June 2012. Deliveries of the 60 kWh model were rescheduled from November 2012 to January/February 2013. A total of 2,650 cars were delivered in North America in 2012. During the first six months of 2013, 10,050 were delivered. The Model S was released in Europe in early August 2013, and the first deliveries took place in Norway, Switzerland and the Netherlands, and by November 2013, the Model S was on sale in 20 countries. Sales totaled about 22,477 units in North America and Europe, surpassing Tesla's annual sales target of 21,500 units. Global cumulative sales passed the 25,000 unit milestone in December 2013. By the end of 2013, according to Elon Musk, Norway and Switzerland became the company's largest per capita sales markets. Retail deliveries in China began in April 2014. The right-hand-drive model was released in the UK in June 2014, followed by Hong Kong in July 2014 and Japan in September 2014. Deliveries in Australia began in December 2014. Global cumulative sales of the Model S passed the 50,000 unit mark in October 2014. A total of 31,655 units were sold worldwide in 2014, allowing the Model S to rank as the world's second best selling plug-in electric vehicle after the Nissan Leaf that year. In 2014 about 55% of Model S deliveries took place in North America, 30% in Europe, and 15% in the Asia-Pacific market. A total of 21,577 units were sold worldwide during the first half of 2015, of which, 11,532 were delivered during the second quarter alone, up about 52% over the same quarter the previous year. As of June 2015[update], the Model S was sold in 30 countries. A total of 11,597 Model S cars were delivered during the third quarter, up about 49% over the same quarter in 2014. A total of 17,272 Model S were delivered during the fourth quarter, up 76% over the same quarter the previous year, and setting a new record for the most cars delivered in a quarter. Global Model S sales passed the 100,000 unit milestone in December 2015, three years and a half after its introduction. A total of 50,446 Model S sedans were sold globally in 2015, making the Model S the world's best-selling plug-in electric car in 2015, ahead of the Nissan Leaf (about 43,000 units). As of December 2015[update], a total of 107,228 Model S sedans had been sold worldwide since its introduction, ranking as the world's second best selling plug-in car ever after the Nissan Leaf (200,000). The United States continued as the largest market with 63,161 units sold. Norway listed as the Model S largest overseas market, with 10,062 new units registered, followed by China with 5,524 units registered through September 2015, and the Netherlands with 4,382 units registered at the end of December 2015. Model S global sales totaled 12,420 units during the first quarter of 2016. Sales during the second quarter of 2016 were lower than anticipated by Tesla, with 9,764 Model S cars delivered worldwide during the quarter. Although production was up 20% from the previous quarter, the number of vehicles in transit at the end of June 2016 was much higher than expected (5,150 including Model X cars), representing 35.8% of the number of cars delivered in the quarter (14,402 vehicles including the Model X). Deliveries in the third quarter of 2016 totaled 16,047 units, for cumulative sales of 38,231 Model S cars during the first nine months of 2016, allowing the Model S to rank as the world's top selling plug-in car during this period, just ahead of the Nissan Leaf. Global Model S sales passed the 150,000 units in November 2016, four years and five months after its introduction, with the largest share, 57%, in the US. With an estimated 12,700 units delivered during the fourth quarter of 2016, sales totaled about 50,931 units in 2016, making the Model S the world's top selling plug-in car for the second year running. The United States had about 29,156 units delivered, followed by China with 6,334, surpassing Norway as the largest Model S overseas market. As of December 2016[update], about 158,159 Model S cars have been sold worldwide since its introduction, making the Model S the world's second best-selling plug-in electric car ever after the Nissan Leaf (250,000), and ahead of the Volt/Ampera family of plug-in hybrids (134,500). Tesla delivered its 200,000th Model S in the fourth quarter of 2017. About 54,715 Model S cars were sold globally in 2017. Of these, an estimated 26,500 were delivered in the United States (48.4%), its main market. After being the world's top selling plug-in car for two consecutive years, the Model S ranked in 2017 as the world's second best seller plug-in after the BAIC EC-Series city car, which sold over 78,000 units in China during 2017. As of December 2017[update], with global deliveries of about 212,874 units, the Tesla Model S continued to rank as the world's all-time second best selling plug-in car after the Nissan Leaf (300,000). Global Model S sales passed the 250,000 unit milestone in September 2018. Global deliveries totaled 50,630 vehicles in 2018. As of December 2018[update], global sales totaled about 263,504 units since inception. The U.S. is Tesla's largest market, with almost 144,000 units delivered since 2012. China ranks second, followed by Norway. ^ Percentage of global sales by country, inception through December 2018. ^ a b Chinese market sales in 2015 only through September. ^ UK registrations at the end of September 2017 (not cumulative sales). ^ Includes registrations in Liechtenstein. ^ Hong Kong sales for 2015 only. ^ Only includes registrations in New South Wales and Victoria. The first nine units were delivered in Sydney on December 9, 2014. Tesla also opened its first store and service centre in St Leonards, and its first Supercharger station at Pyrmont in December 2014. Initially, only two versions were available, the 60 and the 85. The Model S P85D had deliveries scheduled to begin in June 2015. As of December 2014[update], a total of 65 Model S cars were registered in New South Wales and only four in Victoria. At the end of March 2015, registrations totaled 119 in New South Wales and 54 in Victoria. Although there were no sales figures reported for Tesla in other states, the combined sales of these two states alone were enough for the Model S to rank as the top selling all-electric car in the country for the first quarter of 2015, ahead of the BMW i3 (46) and the Nissan Leaf (31). The first deliveries took place on April 22, 2014. The Model S has the same standard equipment as the continental European version, but was adapted to provide larger back seats because the car was expected to be driven by a chauffeur. Only two versions with an 85 kWh battery pack are available in the Chinese market, standard and performance. Chinese sales up to June 2014 were estimated between 1,000 to 1,300 units. JLWarren Capital, an equity firm, estimated that about 2,800 Tesla Model S cars have been imported to China by mid September 2014, but only 432 had received the license plates. According to a Tesla spokesman, the major reasons for the discrepancy could be that registration rules were holding deliveries in Shanghai, and Tesla only recently was able to start delivering the electric cars to customers who bought them in Shanghai. Secondly, many Chinese customers have delayed taking possession of their Model S car while waiting for the government to add the Tesla to the list of electric vehicles exempt from its 8% to 10% purchase tax. As of December 2014[update], Tesla had imported 4,800 Model S cars, but only 2,499 of those vehicles were registered for road use in China. Tesla's CEO expressed disappointment with the Chinese sales, as stock continued to be high by early 2015. As sales improved, Model S sales reached 2,147 units representing an 80% share of the imported plug-in hybrid or electric car segment in China for the first half of 2015. Sales totaled 3,025 units during the first nine months of 2015, for cumulative registrations of 5,524 units through September 2015. Tesla's initial sales target for 2015 was 10,000 units. Sales totaled 6,334 units in 2016. By mid-2018, China ranked as Tesla’s second largest market after the U.S. Sales of the Model S began in July 2014. According to Tesla, as of June 2015[update], Hong Kong has the world's highest density of Tesla superchargers, with eight stations comprising a total of 36 supercharger stalls. This infrastructure allows most Model S owners to have a supercharger within 20 minutes' drive. Sales totaled 2,221 units in 2015, and by August 2016 about 80% of 5,800 EVs in Hong Kong were Teslas. First European deliveries were at Tesla's Oslo store in August 2013. Retail deliveries began in Europe in early August 2013, in Norway, Switzerland and the Netherlands. The two biggest markets for the Model S in Europe are Norway and the Netherlands. The Model S, with about 3,900 units sold, ended 2013 as the third-best selling all-electric car in Europe after the Nissan Leaf and the Renault Zoe. A total of 8,734 Model S cars were sold in 2014, representing a market share of 15.5% of new all-electric passenger car sales in Europe, and again allowing the Model S to rank as the third best selling all-electric car in Europe after the Leaf and the Zoe. Accounting for sales during the first nine months of 2014, the Model S outsold the Audi A8, BMW 7 Series and Jaguar XJ, ranking second in the European luxury vehicle segment after the Mercedes-Benz S-Class. European Model S sales in 2015 totaled 15,515 units, ranking second after the Renault Zoe (18,727) and ahead of the Leaf (15,455). The Model S captured 15.9% of the European all-electric segment sales in 2015. The Model S topped the European luxury car segment in 2015, ahead of the Mercedes-Benz S-Class (14,990), the segment's leader in previous years. Norway was the largest market in 2015 with 4,039 units sold. Cumulative Model S sales in Europe totaled 28,149 units by the end of 2015. A total of 23 units were sold during 2014. During its first full month in the Danish market, the Model S was the top selling electric vehicle with 42 units sold. Sales were 112 units in 2013 and 460 in 2014. Model S sales constituted 35% of the sales of luxury cars by mid 2014. A Model S was tested as a taxi, but high price and low range made the project uneconomical. When the AWD model was announced in Autumn 2014, used Model S were sold fast at high price. In October 2015, the Danish Parliament approved to phase out the tax exemption for electric vehicles, and customers rushed to order the Model S before the price increase. It became the most sold car of any kind in Denmark in December 2015, with 1,248 cars delivered that month, out of 1,573 electric cars sold in December. This is the first time ever that an electric car is the best selling car in Denmark. The Model S comprised 98% of luxury cars sold in Denmark in 2015. Cumulative sales in the country reached 3,308 units through December 2015, of which, a record of 2,736 units were sold in 2015. Sales plummeted to 78 units in 2016 after the phasing out of the country's tax break for electric vehicles at the end of 2015. 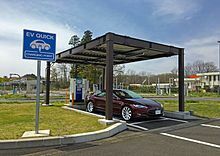 The company announced that by November 2013 the first Tesla Supercharger stations would open between Munich and Stuttgart, Munich and Zurich, Switzerland, and Cologne and Frankfurt. Tesla planned to cover more than 50% of Germany by the end of March 2014, and 100% by the end of 2014. Germany would then have the most Superchargers per capita of any country. By late 2013 Tesla announced a goal to sell 10,000 Model S in Germany in 2015. Registrations totaled 815 units in 2014, representing 2.7% of the luxury segment sales in the country. As of November 2015[update], cumulative registrations totaled 2,354 units. A total of 1,474 Model S cars were registered in Germany in 2016. The first deliveries in the country occurred on August 22, 2013, at Tesla's European Distribution Center in Tilburg. A total of 1,194 units were sold in 2013. After the end of the registration tax exemption, sales fell significantly, and only 262 units were sold during the first four months of 2014. In April 2014 the Schiphol Group announced that three companies were selected to provide all-electric taxi service in Amsterdam Airport Schiphol. The concessions started on June 1, 2014 and service is provided with 100 Tesla Model S cars, which jointed service to the electric buses and hybrid cars already operating at the airport. Sales in 2015 totaled 1,805 units, and declined to 1,693 in 2016. As of October 2016[update], combined registrations of the Model S (5,681) and the Model X (250) represented 48.6% of the 12,196 all-electric cars on Dutch roads at the end of that month. The Model S remained as the all-time top selling all-electric car in the Netherlands with 6,049 cars registered at the end of December 2016. The first delivery of a Model S in Europe took place in Oslo on August 7, 2013. By the end of August 2013, Europe's first six charging stations were opened, in Lyngdal, Aurland, Dombås, Gol, Sundebru and Lillehammer. That month 186 units were delivered, ranking second among all-electric cars behind the Nissan Leaf (448 units). Sales surged in September totaling 616 units, beating the Leaf and achieving an overall new car market share of 5.1%. In 2013, a five-month waiting list emerged creating a used market. Sales dropped to 98 units in October, before jumping back to 527 units in November, ranking it number two in new car registrations after the Volkswagen Golf. In December, sales of 553 units made it the top-selling new car again and capturing a 4.9% market share of new car sales. With less than five months of sales, the Model S ranked 20th for the year with a market share of 1.4% of Norwegian new car sales, Tesla's largest in Europe. The Model S topped the monthly sales ranking for a third time in March 2014, with 1,493 units sold, breaking the 28-year-old monthly sales record, surpassing the Ford Sierra, which sold 1,454 units in May 1986. Sales totaled 2,056 Model S cars during the first quarter of 2014, making the Model S the best selling new car in Norway during this period. The Model S captured a 5.6% market share of new car sales and 38.8% of the new plug-in electric car segment during this quarter. By the end of 2014, the Model S ranked as the fifth best selling new car in the Norwegian market, with 4,040 units registered and a market share of 2.8% of new car sales in the country that year. As of July 2014[update], Norway ranked as Tesla's largest overseas market, with an average of 436 Model S sedans sold per month since August 2013. In comparison, the average in the United States was about 1,630 units delivered per month since the electric car went on sales in 2012. As of December 2015[update], Norway continued as the second largest Model S market by volume, with about 9.4% of cumulative global sales. After a stagnant year of 4,000 plus deliveries for 2015, deliveries of Tesla dropped 54% in the first quarter and 52% in the second quarter of 2016 in Norway. Tesla Model S registrations in Norway totaled 2,051 new units in 2016 and 3,712 in 2017. Since its introduction, a total of 15,825 new Model S cars have been registered in Norway through December 2017. Retail deliveries began in August 2013, and a total of 213 units were registered in 2013. The Model S, with 496 units registered, ranked as the top selling plug-in electric car in the country in 2014. With 835 units sold during the first seven months of 2015, the Model S outsold combined Swiss sales of the luxury segment including such models as the Mercedes S-Class, Audi A8 and BMW 7 Series during the same period. Cumulative Model S sales totaled 3,060 units up until June 2016, which includes units sold in Liechtenstein. Deliveries began in June 2014, and a total of 698 units were registered in the UK by the end of 2014. Model S owners are also exempted from the London congestion charge. During the first half of 2016, slightly more Model S cars were registered in the UK than in Norway, the largest Model S market in Europe. During the first six months of 2016 a total of 1,263 Model S sedans were registered in the UK and 1,248 in Norway. A total of 3,907 Model S sedans were registered in the UK at the end of September 2016. The first Model S sedans were delivered in December 2012. Cumulative sales totaled 3,590 units as of December 2015[update], and ranks as the second best-selling plug-in car in the country ever after the Chevrolet Volt (5,415) and ahead of the Nissan Leaf (3,198). The Model S was the top selling plug-in electric car in Canada in 2015 with 2,010 units sold. Retail sales began in Mexico City in December 2015. Initially, no Supercharger stations are available in the country. The first delivery took place on June 1, 2012. Deliveries for retail customers in the United States started on June 22, at a special event held at the Tesla Factory in Fremont, California. The first 1,000 production units were Signature and Signature Performance limited editions equipped with an 85 kWh battery pack. Cumulative sales passed the 50,000 unit milestone in early July 2015. About 2,620 units were sold in the U.S. during 2012 out of 2,650 units delivered in North America. California is the largest American regional market for the Model S. In March 2013, Tesla reported the delivery of the 3,000th Model S in California, representing around 50% of US sales to that date. During the first quarter of 2013 the Model S ranked as the top selling plug-in electric vehicle in the U.S. with about 4,900 units delivered, followed by the Chevrolet Volt with 4,244 units. During 2013, the Model S was called as the least stolen car in the United States by the Value Walk financial website, with a theft rate of 0.15 per 1,000 units produced. By comparison, the U.S. average is 3.51 cars stolen per 1,000 produced. According to Edmunds.com, between January and August 2013 the Model S achieved a high market share of new car sales among the U.S. most expensive ZIP codes, as rated by Forbes, led by California. Atherton ranked first with a 15.4% share, followed by Los Altos Hills with 11.9%, and Portola Valley with 11.2%. During this period the Model S had the highest number of new passenger car registrations in 8 of the 25 most expensive American ZIP codes. With 8,347 units sold in 2013, it was the third-best selling luxury car in California (after the Mercedes-Benz E-Class and BMW 5 Series sedans), with a 9.8% share of the Californian luxury and sports segment. As of November 2013[update], the Model S was available nationwide, with California having 48% share U.S. sales. California is the top selling regional market of the Model S. Shown in San Francisco. American sales totaled about 18,650 units in 2013, placing the Model S as the third selling plug-in electric car after the Chevrolet Volt (23,094) and the Nissan Leaf (22,610). Also in 2013, the Model S was the top seller in the full-size luxury sedan category, ahead of the Mercedes-Benz S-Class at 13,303. In 2014, 16,689 Model S sedans were delivered, down 10.5% from 2013, but the electric sedan ranked again as the third best selling plug-in car in the U.S. In 2015 the Model S ranked as the top selling plug-in electric car in the U.S, with 25,202 delivered, surpassing both the Leaf (17,296) and the Volt (15,393). The Model S was also the country's best-selling car in the large luxury segment among comparably priced four-door sedans, ahead of the Mercedes-Benz S-Class (21,934) and BMW 7 Series (9,292). Registrations in California totaled 10,723 units in 2015, representing a 12.1% market share of the state's luxury and sports segment, making the Model S the third best selling car in the segment after the Mercedes-Benz E-Class (12,324) and BMW 5 Series (11,133). By the end of 2015, cumulative sales in the American market represented almost 60% of Model S global sales since its introduction. Tesla reported 9,156 units sold nationwide in the third quarter of 2016, up 59% from the same quarter in 2015, allowing the Model S to led national sales in the large luxury car segments, representing almost a third of the segment sales, and ahead of the Mercedes-Benz S-Class (4,921) and the BMW 7 Series (3,634). The Model S was the top selling plug-in electric in the American market for the second year in a row with an estimated 29,156 units delivered in 2016. Registrations in California totaled 11,326 units in 2016, representing a 14.1% market share of the state's luxury and sports segment, making the Model S the second best selling car in the segment after the Mercedes-Benz E-Class (11,684) and ahead of the BMW 5 Series (10,551). According to Wards's Auto, the Model S topped the American upper luxury segment in 2016, followed by the Mercedes S-Class (18,803) and the BMW 7-Series (12,918). An estimated 92,317 Model S cars have been sold in the United States up until December 2016, representing about 57% of Model S global sales through November 2016. Model S sales in the American market passed the 100,000th unit mark in early June 2016, achieving this milestone in less time since inception than both the Chevrolet Volt and the Nissan Leaf. A total of 11,813 Model S were sold in California in 2017, representing of 16.0% of the state's luxury and sports segment, ranking second after the Mercedes-Benz E-Class (12,326). Among all-electric models sold in California in 2017, the Model S listed second after the Chevrolet Bolt (13,487). An estimated 26,500 Model S cars were sold in the U.S. in 2017, down 9.1% year-on-year, but allowing the Model S to end 2017 as the best selling plug-in car in the American market for the third consecutive year. California registrations represented 44.6% of national sales. Cumulative sales since inception totaled an estimated 118,817 units through December 2017. Owners of the Model S are overwhelmingly male and over 45 years old. Tesla sells its cars directly to consumers without creating a dealer network, as other manufacturers have done and as many states require by legislation. In support of its approach, the company has fought legal and legislative battles in Ohio, New Jersey, New York and other states. With law changes in recent years in New Jersey, New York, Maryland, Ohio, and Pennsylvania the Tesla direct sales model is permitted in 22 states as of March 2015. As of May 2015[update] the sales procedure in other states such as Texas is somewhat different with the Tesla salesperson being prevented from discussing prices, the actual sale having to be made online and the sales tax having to be paid up front. Delivery of a Tesla car to a Texas address is no different than in other states. Consequently, while Tesla showcases and sells its cars directly to the consumer in Tesla Stores abroad, it operates a mix of Tesla Stores and Tesla Galleries in the US. In 2014, the Model S has a 5-star safety rating from both Euro NCAP and the U.S. National Highway Traffic Safety Administration (NHTSA). At that time, only two other cars had earned the same recognition since 2011 (when the NHTSA introduced its latest rating scheme). However, in July 2017, the Insurance Institute for Highway Safety (IIHS) found that during front crash tests, the Model S safety belts let the driver's torso move too far forward, resulting in the head striking the steering wheel hard through the airbag. This problem was already pointed out in one of the IIHS's earliers tests, to which Tesla responded they would improve their safety belt design, which, according to the IIHS's latest tests, has not been done. The IIHS also gave the Model S the worst possible rating for its headlights. The report caused Tesla to lose 6.4% of its stock value. The first widely reported Model S fire occurred several minutes after the vehicle hit metal debris on the Washington State Route 167 highway in Kent, Washington on October 1, 2013. The driver "was able to exit the highway as instructed by the onboard alert system, bring the car to a stop and depart the vehicle without injury". He then contacted authorities and, while awaiting their arrival, smoke began coming out the front of the vehicle. The driver stated that he hit something while exiting the HOV lane. Tesla stated that the fire was caused by the "direct impact of a large metallic object to one of the 16 battery modules", and that by design, the modules were separated by firewalls, limiting the fire to "a small section in the front of the vehicle". The module was evidently punctured by a "curved section" that fell off a truck and was recovered near the accident. Tesla stated that the debris punched a 3-inch (76 mm) diameter hole through the .25-inch (6.4 mm) armor plate under the vehicle, applying force of some 25 tons. Built-in vents directed the flames away from the vehicle so that the fire did not enter the passenger compartment. According to Tesla, the firefighters followed standard procedure; using large amounts of water to extinguish the fire was correct, however, puncturing the metal firewall to gain access to the fire also allowed the flames to spread to the front trunk. Tesla also stated that because the battery pack contains "only about 10% of the energy contained in a gasoline tank", the effective combustion potential of a single module is only about 1% that of a conventional vehicle. On October 24, 2013, the U.S. National Highway Traffic Safety Administration (NHTSA) announced, "After reviewing all available data, the National Highway Traffic Safety Administration has not found evidence at this time that would indicate the recent battery fire involving a Tesla Model S was the result of a vehicle safety defect or noncompliance with federal safety standards." But the following month, the NHTSA opened a preliminary evaluation to determine "the potential risks associated with undercarriage strikes on model year 2013 Tesla Model S vehicles". On March 28, 2014, NHTSA closed its investigation, claiming that the new titanium underbody shield and aluminum deflector plates, along with increased ground clearance, "should reduce both the frequency of underbody strikes and the resultant fire risk". On November 6, 2013 another fire broke out after a Model S struck a tow hitch on the roadway, causing damage beneath the vehicle. The incidents led Tesla to extend its vehicle warranty to cover fire damage and to apply a software update to increase ground clearance when operating at highway speed. Another fire incident took place in Toronto, Canada, in early February 2014. The Model S was parked in a garage and was not charging when the fire started. The origin of the fire is undetermined. According to Tesla "in this particular case, we don't yet know the precise cause, but have definitively determined that it did not originate in the battery, the charging system, the adapter or the electrical receptacle, as these components were untouched by the fire". Starting with vehicle bodies manufactured as of 6 March 2014[update], all units were outfitted with a triple underbody shield. Existing cars were retrofitted upon request or as part of a normally scheduled service. On January 1, 2016, a 2014 Model S caught fire in Norway while supercharging unsupervised in Brokelandsheia, Norway. The vehicle was totally destroyed but nobody was injured. The fire was slow, and the owner had time to unplug the car and retrieve possessions. An investigation by the Norwegian Accident Investigation Board (AIBN) indicated that the fire originated in the car, but was otherwise inconclusive. In March 2016, Tesla stated that their own investigation into the incident concluded that the fire was caused by a short circuit in the vehicle's distribution box, but that the amount of damage prevented them from determining the exact cause. Tesla stated that the Supercharger detected the short circuit and deactivated, and a future Model S software update would stop the vehicle from charging if a short circuit is detected. The National Transport Safety Board (NTSB) has stated that the Tesla’s electric cars are not more prone to fires than other vehicles on the road today. On August 19, 2013, based on NHTSA safety ratings, a Tesla press release claimed that the Model S had achieved the best safety rating of any car ever tested. Tesla stated, "NHTSA does not publish a star rating above 5, however safety levels better than 5 stars are captured in the overall Vehicle Safety Score (VSS) provided to manufacturers, where the Model S achieved a new combined record of 5.4 stars." However, a few days later NHTSA rebutted Tesla's claim, explaining that the rating for the Model S was equal to any other car receiving 5-stars, and claiming that the carmaker did not follow its advertising guidelines. On June 14, 2013, Tesla issued a recall to all Model S vehicles manufactured between May 10, 2013, and June 8, 2013, due to improper methods for aligning the left hand seat back striker to the bracket, which could weaken the weld between the bracket and frame of the car. On January 13, 2014, Tesla recalled Model S vehicles manufactured in 2013, because the adapter, cord, or wall outlet could overheat during charging. On November 20, 2015, Tesla announced a voluntary worldwide recall of all of its 90,000 Model S vehicles, in order to check for a possible defect in the cars' front seat belt assemblies. The problem was raised in early November by one customer in Europe. Tesla's resulting investigation was unable to identify a root cause for the failure, and the company decided to examine every single car. Tesla reported that there have been no accidents or injuries related to the problem. On January 20, 2017, Tesla recalled Model S from 2012 in January 2017 due to defective Takata airbags. Cars manufactured later (until 2017) have smaller risk, and may also be recalled. On April 20, 2017, Tesla issued a worldwide recall of 53,000 (~70%) of the 76,000 Model S and Model X vehicles it sold in 2016 due to faulty parking brakes. On March 30, 2018 all 123,000 Model S cars manufactured before April 2016 were recalled due to excessive corrosion of the bolts which secure the power steering, particularly those cars used in cold countries where roads are salted. 2013 World Green Car of the Year. Automobile Magazine's 2013 Car of the Year, a unanimous decision. Consumer Reports gave the Model S a score of 103 out of 100, its highest ever. The Model S broke the rating scale of Consumer Reports during its most recent test. Consumer Reports' 2013 survey of owner satisfaction produced a score of 99 out of 100, "the highest the magazine has seen in years." In 2014 the Model S topped for the second year in a row Consumer Reports survey of owner satisfaction. This time the Model S had a score of 98 out of 100. Consumer Reports found the Model S to be 'Best Overall' for 2014 across all 10 categories of cars, light trucks and SUVs, chosen from more than 260 vehicles the organization has recently tested. The magazine considers the Model S a "technological tour de force, while pricey, is brimming with innovation." In 2015 they rated the Model S at 103 (breaking the scale). Motor Trend 2013 Car of the Year, also a unanimous decision and the first winner in the award's history to not be powered by an internal combustion engine. The Telegraph included the Model S in its list of the top 10 cars that changed the world published in December 2014, and also named the electric sedan the most important car of the last 20 years. Time Magazine Best 25 Inventions of the Year 2012 award. Yahoo! Autos 2013 Car of the Year. American Automobile Association Green Car Guide 2015, top spot (P85D). The Model S also won the 2014 AAA Green Car Guide. A distance record of 670 mi (1,080 km) in a P100D was set on August 5, 2017 by Italian drivers, making the Model S the first production electric car to exceed 620 mi (1,000 km) on a single charge. Previously the record of 560 miles (901.2 km) in a P100D was set on June 20, 2017 by Belgian drivers. Before that the distance record was 452.8 miles (728.7 km) in a Model S. It was made by Norwegian Bjørn Nyland and Morgan Tørvolt on a flat stretch with low traffic around the supercharger in Rødekro, Denmark. All of these records used hypermiling techniques such as front motor only, low speed 24 mph (39 km/h), no air conditioning and minimal use of the brakes. The first record of 423.5 miles (681.6 km) was set during November 2012 by David and Adam Metcalf. These attempts were inspired by a blog written by Elon Musk about the planned range and efficiency of the Tesla Model S, offering a prize for anyone exceeding 400 miles (643.7 km) on a single charge, where it was estimated the 85 kwh model could do it by driving at a constant 36 mph (58 km/h) under ideal conditions. On February 8, 2013, The New York Times published a review by John M. Broder about a trip between Washington, D.C., and Boston using Tesla's Supercharger network. At the time it included only two stations on the East Coast. Broder made a variety of critical claims about the battery's performance in cold weather and the distance between charging stations. The trip ended with the Model S carried by a flatbed truck to the Milford, Connecticut, station. Tesla responded by publishing logs of the vehicle's charge levels and driving speed that contradicted Broder's account on several factual details. Tesla implied that Broder's behavior forced the car to fail. Broder replied to the criticism in a blog post and suggested that the speed discrepancies may have been because the car had been equipped with 19-inch wheels rather than the specified 21-inch wheels. In the midst of the controversy, a CNN reporter recreated Broder's trip without exhausting the battery. However, two key differences distinguished the two journeys. The weather was about 10 °F (6 °C) warmer and CNN did the trip in one day; the Times let the car sit overnight without being plugged in. A reporter from CNBC also recreated the trip in one day without incidents. One week later, a group of Tesla owners recreated Broder's trip without problems. One owner was delayed because his car failed to charge and required two firmware updates. On February 18, 2013, The New York Times Public Editor Margaret Sullivan published an editorial stating that Broder took "casual and imprecise notes" of his test drive and did not use good judgment, but she maintained that the article was written in good faith. She also admitted that Broder's vehicle logs were "sometimes quite misleading." In July and September 2014 tests performed by an independent German car magazine in cooperation with the TÜV (German Association for Technical Inspection) and Tesla owners seemed to reveal issues with the battery's performance. According to the magazine, Tesla did not take up the invitation to repeat the test, and also seemed to refuse to offer vehicles for a second test. A test performed by another German publication ("Die Welt") supported the findings. In 2007, Tesla announced plans to build 10,000 Model S sedans annually starting in 2009. Production was delayed, and Tesla's website later stated that deliveries would start in 2011. However, in January 2010, Musk stated that he expected to launch the Model S sedan "within two and a half years", translating to Q3 2012. Older versions of the system software suffered from power drain issues when the car wasn't being used, with the batteries losing 4.5 kWh overnight (known commonly as "vampire drain"). System software v5.8 (v1.49.30), released December 12, 2013, reduced overnight energy loss substantially, to 1.1 kWh per night, or around 3 miles. In October 2015, two months after naming the Tesla 'the best car ever tested,' Consumer Reports declined to give the Tesla Model S a "recommended" designation, citing too many complaints from owners. Complaints ranged from minor, such as misaligned doors and squeaky body, to severe - things like total drive train replacement and inoperable door handles. Tesla's shares dropped 15%, both because of the magazine's cut and because of concerns over the Tesla Model X luxury SUV. Similarly, Edmunds.com found quality and safety issues in their long-term road test and "amassed quite the repair résumé during the last 17 months." Both Edmunds and Consumer Reports reported issues, including the vehicle stalling while driving. In their 2016 Annual Auto Reliability Survey, Consumer Reports improved the Model S rating to average reliability, while reporting that the Model X has had significant malfunction issues. The magazine also raised "serious concerns about how some automakers, including Tesla, have designed, deployed, and marketed semi-autonomous technology." By 2017, in the Consumer Reports Car Reliability Survey, Tesla's position on the list had moved up four spots; the predicted reliability rating for Model S reached "above average" for the first time. The P85D "Insane" was widely reported to have 691 horsepower, but some owners reported 20% less power on dynamometer in various circumstances. Manufacturers are required by EU law to display power "at full setting of the power controller" (from an external DC source when performing laboratory vehicle approval), but not necessarily to show power limited by battery. Other equipment must be removed, or their power added to the measurement. Actual power available depends on circumstances, as it does for piston cars which until 1972 could be 25–30% less than given. As of November 2015[update], Tesla website showed battery-limited combined 463 hp for P85D (532 hp for "Ludicrous"). A lawsuit by 126 owners in Norway was settled in December 2016. The autonomy functions of the Model S, including Autosteer and adaptive cruise control, have limitations that have led to collisions when the driver becomes inattentive. Tesla warns in the owners manual that drivers always must be aware of road conditions and not rely on the cruise control to prevent a collision, as the system may not detect stationary vehicles or obstacles, bicycles, and pedestrians. However, critics such as scientist Andrew Ng have accused Tesla of being irresponsible by releasing a product with such limitations as it can lull drivers into a false sense of security. 2 of an equivalent gasoline-powered vehicle. ^ a b Lam, Brian (2007-02-19). "Tesla Whitestar Electric Sedan: 4 Doors, Half the Price of the Roadster". Gizmodo.com. Retrieved 2012-05-06. ^ a b Johnson, Merritt (2008-02-04). "Tesla Whitestar to be offered as both an EV and a REV". CNET News. Retrieved 2012-05-06. ^ a b Abuelsamid, Samuel (2008-06-12). "Super-secret photo of Tesla Whitestar leaks out of San Carlos". Autoblog Green. Retrieved 2013-10-08. ^ a b "Model S Specs and Standard features". Tesla Motors. Archived from the original on 2013-08-31. Retrieved 2013-08-08. ^ "Model S Optionen und Preis" [Model S options and Price] (in German). Germany: Tesla Motors. Retrieved 2013-08-08. ^ "Tesla Model S Dual 80 A Charger (second onboard 40 A Charger)". Tesla Motors. Archived from the original on 2016-12-04. ^ Sabatini, Jeff (November 2014). "2014 Tesla Model S 60 Full Test – Review". Car and Driver. Retrieved 2015-05-07. ^ a b c Cantle, Chriss (2014-10-09). "Tesla Model S P85D: Dual motors, AWD, 691 hp, 3.2 to 60". Road & Track. Retrieved 2015-05-12. ^ Sherman, Don (May 2015). "2015 Tesla Model S 70D". Car and Driver. Retrieved 2015-05-12. ^ a b c John Boudreau (2012-06-22). "In a Silicon Valley milestone, Tesla Motors begins delivering Model S electric cars". San Jose Mercury News. Retrieved 2012-06-22. ^ Lambert, Fred (2017-07-01). "Tesla introduces new performance enhancements to Model S and Model X". Electrek. Retrieved 2017-07-01. ^ "2017 Tesla Model S AWD - 100D". www.fueleconomy.gov. Retrieved 2017-12-19. ^ "Tesla Quietly Introduces Longest-Range Electric Car on the Market". Fortune. 2017-01-22. Retrieved 2017-04-11. ^ "Tesla Model 3 actually has 334 miles of range according to EPA data". US: Teslarati. 2017-09-19. Retrieved 2017-09-19. ^ a b "Compare Side-by-Side". fueleconomy.gov. U. S. Environmental Protection Agency and U.S. Department of Energy. Retrieved 2017-04-21. ^ "Tesla Motors Model S". Tesla Model S. Official Site. Retrieved 2016-04-13. ^ a b Grønn bil (2013-10-01). "Norges mest solgte bil i september er en elbil" [Norway's best selling car in September is an electric vehicle] (in Norwegian). Grønn bil. Archived from the original on 2013-10-04. Retrieved 2013-10-02. ^ a b Gasnier, Mat (2013-10-02). "Norway September 2013: Tesla Model S in pole position!". Best Selling Cars Blog. Retrieved 2013-10-02. ^ a b Voelcker, John (2013-10-01). "Tesla Model S Was Best-Selling Car in Norway For September". Green Car Reports. Retrieved 2013-10-02. ^ a b Mark Kane (2014-01-04). "Tesla Model S Again No. 1 in Overall Sales in Norway in December!". InsideEVs.com. Retrieved 2014-01-04. ^ a b Christensen, Thomas Bo (2016-01-04). "Tesla blev Danmarks mest solgte bil i december" [Tesla was Denmark's best selling car in December]. Energi Watch (in Danish). Retrieved 2016-01-07. ^ a b c d e f g h i j k Cobb, Jeff (2018-01-22). "Tesla Quietly Sold 200,000th Model S Last Year". HybridCars.com. Retrieved 2018-01-23. "Tesla sold its 200,000 Model S in the fourth quarter of 2017, in October or early November, becoming the second plug-in car to cross this sales threshold after the Nissan Leaf (300,000 units by early 2017). As of December 2017[update], Tesla reported global sales of 212,874 Model S cars." ^ a b c d e f "Tesla Q1 2018 Vehicle Production and Deliveries". Palo Alto: Tesla. 2018-04-03. Retrieved 2018-09-02. ^ a b c d e f "Tesla Second Quarter 2018 Delivery". Palo Alto: Tesla. 2018-07-02. Retrieved 2018-09-02. ^ a b c d e f "Tesla Q3 2018 Vehicle Production and Deliveries". Palo Alto: Tesla. 2018-10-02. Retrieved 2018-10-20. ^ a b c Mark Kane (2019-01-03). "U.S. Tesla Sales In December 2018 Up By 249%". Inside EVs. Retrieved 2019-01-28. Cumulative sales in the U.S. of the three Tesla models available in 2018 totaled 351,298 vehicles, consisting of 143,892 Model S cars, 141,546 Model 3 cars, and 65,852 Model X SUVs, all, since inception. ^ a b c d e Cobb, Jeff (2017-01-11). "America's Plug-in Car Sales Were Their Best Ever in 2016". HybridCars.com and Baum & Associates. Retrieved 2017-01-12. Plug-in electric car sales in the U.S. totaled 157,181 units, up 37.6% from 2015 (114,248). The plug-in car segment achieved an all-time high market share of 0.90% of new car sales in 2016. December sales totaled a record monthly volume of 23,288 units and also achieved a record monthly market share of 1.39% of new car sales. The top selling model for the second year in a row was the Tesla Model S with 29,156 units sold in 2016, followed by the Chevrolet Volt (24,739), Tesla Model X (18,028), Ford Energi Fusion (15,938), and the Nissan Leaf (14,006). As of December 2016[update], cumulative sales totaled 570,187 plug-in cars since 2008, with the Chevrolet Volt as the all-time best selling plug-in car with 113,489 units. The Tesla Model S ranks third with an estimated 92,317 units since its inception in 2012. ^ a b Sharan, Zachary (2017-02-04). "Tesla Model S & Nissan LEAF Clocked As World's Best-Selling Electric Cars In 2016". EV Volumes. CleanTechnica.com. Retrieved 2017-02-04. ^ "10 Most Satisfying Cars". Consumer Reports. Retrieved 2018-06-18. ^ Wert, Ray (2007-02-20). "Darryl Siry responds to rumor on Jalopnik forum". Jalopnik.com. Retrieved 2010-11-27. ^ Richard, Michael Graham (2008-06-30). "Tesla's Next Electric Car to be Called "Model S", New Factory to Open in North California". TreeHugger.com. Retrieved 2012-05-06. ^ Monticello, Mike (2008-10-23). "Tesla Builds a 4-Door – New and Future Cars". Road & Track (Hachette Filipacchi Media, U.S., Inc.). Archived from the original on 2010-06-04. Retrieved 2011-05-04. ^ "Tesla debuts electric car for the masses". CBC News. 2009-03-27. Retrieved 2009-03-28. ^ Kanellos, Michael (2008-02-01). "Tesla to make gas-electric car". News.com. Retrieved 2010-11-27. ^ "Tesla Kills Its Gas-Electric Hybrid". Greenlight.greentechmedia.com. 2008-09-18. Archived from the original on 2008-09-22. Retrieved 2010-11-27. ^ Severns, Dave. "Tesla Motors blog post regarding Albuquerque decision". Teslamotors.com. Archived from the original on 2007-03-17. Retrieved 2010-11-27. ^ "Tesla Motors press release – announcement of Albuquerque plant". Teslamotors.com. Archived from the original on 2010-04-06. Retrieved 2010-11-27. ^ "The Albuquerque Tribune Editorial: Don't hold your breath on Tesla Motors plant". Abqtrib.com. Archived from the original on 2012-02-14. Retrieved 2010-11-27. ^ "Tesla to build electric car factory in Bay Area". San Jose Mercury News. Retrieved 2010-11-27. ^ "Tesla Wants NUMMI Operational By 2012". Ktvu.com. 2010-05-20. Archived from the original on 2010-05-23. Retrieved 2010-11-27. ^ Sherman, Don. "2015 Tesla Model S 70D". Tesla Model S. Car and Driver. Retrieved 2015-07-30. ^ a b "Consumer Reports Cuts Tesla From Its Recommended List Over Reliability". Yahoo!. Retrieved 2015-10-27. ^ a b "Consumer Reports Car Reliability Survey 2016". Consumer Reports. 2016-10-24. Retrieved 2016-10-24. ^ "Tesla Model S one billion miles". Western Morning News. 2015-06-23. Archived from the original on 2015-06-24. Retrieved 2015-06-23. ^ a b c Cobb, Jeff (2015-06-23). "Happy 3rd Birthday Tesla Model S: Fleet Is First To Travel One Billion Miles". HybridCars.com. Retrieved 2015-06-23. ^ a b Cobb, Jeff (2015-12-15). "Tesla Model S Crossed 100,000 Sales Milestone This Month". HybridCars.com. Retrieved 2015-12-16. ^ a b c d Cobb, Jeff (2016-12-05). "Tesla Model S Is Second Plug-in Car To Cross 150,000 Sales Milestone". HybridCars.com. Retrieved 2016-12-05. ^ van Leeuwen, Andrew (2016-03-10). "World-first electric GT series launched". Motorsport. Retrieved 2016-03-15. ^ Korosec, Kirsten (2016-04-12). "Tesla's Model S Will Look Different Starting Today". Fortune. Retrieved 2016-05-09. ^ "Tesla, Inc". Tesla. Retrieved 2018-05-29 – via GitHub. ^ Lambert, Fred (2018-05-19). "Tesla releases some of its software to comply with open source licences". Electrek. US. Retrieved 2018-05-29. ^ Kuhn, Bradley M.; Sandler, Karen M. (2018-05-18). "Congratulations to Tesla on Their First Public Step Toward GPL Compliance". Software Freedom Conservancy. Retrieved 2018-05-29. ^ "Tesla Motors 10-k Page 42". February 26, 2015. Archived from the original on March 24, 2015. Retrieved March 23, 2015. ^ King, Danny (2012-12-13). "Tesla will assemble, distribute vehicles in Holland for European market". Autoblog Green. Retrieved 2012-12-23. ^ a b Willebrands, Michiel (2013-08-22). "Tesla opent assemblagecentrum in Tilburg" [Tesla opens assembly center in Tilburg] (in Dutch). Auto Week Netherlands. Retrieved 2013-10-07. ^ Rogowsky, Mark (2014-02-05). "Musk: 'We Hope The Big Car Companies Do Copy Tesla'". Forbes. Retrieved 2014-09-05. ^ a b Blankenship, George (2012-08-21). "Inside Tesla". Tesla Motors. Retrieved 2012-08-24. ^ Gordon-Bloomfield, Nikki (2015-05-06). "Tesla Motors Posts Q1 2015 Losses, Due to Strong Dollar, High Capital Expenditures. Hits 1,000 Car/Week Model S Production". Transport Evolved. Retrieved 2015-05-08. ^ a b c d e Spring, Jake (2015-10-23). "CORRECTED-(OFFICIAL)-UPDATE 2-Tesla CEO says negotiating with China on local production". Reuters. Retrieved 2015-10-24. Tesla sold sold 3,025 Model S cars in China from January to September 2015. ^ Yu, Rose (2015-10-23). "Tesla Aims to Build Its Electric Cars in China". The Wall Street Journal. Retrieved 2015-10-25. ^ "Tesla's Latest Aim: Build 500,000 Cars a Year in China". New York Times. 2018-07-10. Retrieved 2018-07-10. ^ Dillard, Ted (2014-09-23). "Rare Look Inside A Tesla Model S Battery Pack". InsideEVs. Retrieved 2014-09-23. ^ "2016 Tesla Model S (70 kW-hr battery pack) [click "Specs"]". U.S. Department of Energy. Retrieved 2016-08-11. ^ "Fuel Economy of 2016 Luxury Sedans with MPG >= 45". U.S. Department of Energy. Retrieved 2016-08-11. ^ Thiel, Christian; Krause, Jette; Dilara, Panagiota (2015). "Electric vehicles in the EU from 2010 to 2014 – is full scale commercialisation near?" (PDF). European Commission Joint Research Centre. pp. 9, 15–16. Retrieved 2016-08-12. ^ Fergusson, Malcolm (2015). "How clean are Europe's cars?" (PDF). European Federation for Transport and Environment. p. 14. Retrieved 2016-08-12. ^ a b "Neuzulassungen von Personenkraftwagen nach Segmenten und Modellreihen im Dezember 2015" [New registrations of passenger cars by segments and models in December 2015] (PDF) (in German). Kraftfahrt-Bundesamt (KBA). January 2016. Retrieved 2016-01-18. A total of 1,582 Model S cars were registered in Germany in 2015. ^ a b "Model S Specifications". Tesla Motors. Retrieved 2015-12-05. ^ "Tesla Model S first drive". CNET. Retrieved 2013-01-28. ^ Berman, Bradley (2012-09-28). "One Big Step for Tesla, One Giant Leap for E.V.'s". The New York Times. Retrieved 2012-09-29. ^ Sherman, Don (June 2014). "Drag Queens: Aerodynamics Compared – Comparison Test". Car and Driver. Retrieved 2014-06-09. ^ "front/rear differential?". Tesla Forums. 2014-08-07. Retrieved 2015-08-30. ^ a b Tingwall, Eric (June 2015). "2015 Tesla Model S P85D – Driving 40,000 miles, 250 miles at a time". Car and Driver. Archived from the original on 2015-09-28. ^ Shahan, Zachary (2015-09-23). "JB Straubel Answers (Trolls?) Tesla Horsepower Critics". Clean Technica. ^ "Tesla Model S Performance – Battery". Tesla Motors. Retrieved 2012-06-22. ^ Davies, Alex (2015-07-17). "Tesla's New 'Ludicrous Mode' Makes the Model S a Supercar". Wired. Retrieved 2015-09-11. ^ Eisenstein, Paul A. (2015-07-17). "When 'Insane Mode' Isn't Enough – Tesla Adds "Luuudicrous Mode"". The Detroit Bureau. ^ Tingwall, Eric (2016-05-20). "2015 Tesla Model S P85D – Not quite weatherproof". Car and Driver. US. Retrieved 2016-05-20. ^ a b Markus, Frank (2017-02-07). "2017 Tesla Model S P100D First Test: A New Record – 0–60 MPH in 2.28 Seconds!". Motor Trend. Retrieved 2017-12-02. ^ Colwell, K.C. (2014-07-25). "Porsche 918 Spyder Tested: 2.2 Seconds to 60!". Car and Driver. Retrieved 2017-04-11. ^ Yvkoff, Liane (2017-01-11). "Tesla May Reduce Vehicle Power After Too Many Ludicrous Mode Engagements". The Drive. Retrieved 2017-07-13. ^ "Porsche Manager Reportedly Calls Tesla's Ludicrous Mode a "Facade"". Road & Track. 2016-06-16. Retrieved 2017-07-13. ^ a b "Tesla Model S battery pack data shows very little capacity loss over high mileage". Electrek. 2016-06-06. Retrieved 2016-08-20. ^ a b c d Blanco, Sebastian (2015-07-17). "Tesla announces Model S Ludicrous upgrade, 90-kWh battery". Autoblog. Retrieved 2015-07-17. ^ a b Mukherjee, Sy (2017-10-30). "This YouTuber Takes 25 Minutes to Explain Everything Wrong With His Tesla Model S". Fortune. US. Retrieved 2018-04-19. ^ Alspach, Kyle (2014-10-09). "New Tesla Is Way More Robotic and Also One of the Fastest Sedans on the Planet". BostInno. ^ a b Davies, Alex (2014-10-10). "The Model D Is Tesla's Most Powerful Car Ever, Plus Autopilot". Wired. Retrieved 2014-10-11. ^ "Tesla Model D: Elon Musk's new electric car is company's most powerful yet". The Independent. 2014-10-10. ^ a b Noland, David (2014-11-11). "2014 Tesla Model S: 2014 Tesla Model S: Killing 3 Versions, 2 Colors, Some Options". Green Car Reports. Retrieved 2014-11-27. ^ Bruce, Chris (2015-04-08). "Tesla adds Model S 70D with all-wheel drive to lineup for $75k". AutoBlog. Retrieved 2015-04-17. ^ "Model S Design Studio". my.teslamotors.com. Tesla Motors. Retrieved 2015-07-07. ^ Weintraub, Seth (2016-06-09). "Tesla's new 60kWh pricing option is a software revolution, here are the exclusive details". Electrek. US. Retrieved 2016-06-09. ^ O'Kane, Sean (2016-06-09). "Tesla just released two cheaper versions of the Model S". The Verge. Vox Media. Retrieved 2016-06-11. ^ a b Lambert, Fred (2016-08-24). "Tesla's new Model S P100D is not only quick, it's the first all-electric car with over 300 miles of range". Eleckrek. Retrieved 2016-09-08. ^ a b c d "Tesla Model S P100D". www.deeptread.com. Deep Tread. Retrieved 2016-09-17. ^ "New Tesla Model S Now the Quickest Production Car in the World". www.tesla.com. Retrieved 2016-09-17. ^ "Tesla Model S lineup slims down as 60, 60D versions end". Green Car Reports. Retrieved 2017-03-22. ^ Szostech, Michael. "Tesla Model S Version Comparison and Specifications". Electric Vehicle Wiki. Retrieved 16 April 2019. ^ Voelcker, John (2012-12-07). "Tesla Model S 60-kWh Version: EPA Range Rated At 208 Miles". Green Car Reports. Retrieved 2012-12-07. ^ "Compare Side-by-Side". fueleconomy.gov. U. S. Environmental Protection Agency and U.S. Department of Energy. Retrieved 2017-04-21. ^ Ingram, Antony (2013-01-02). "Tesla Model S Owner Drives Coast To Coast Electrically (Again)". Green Car Reports. Retrieved 2013-01-09. ^ Fowler, Steve (2014-07-21). "Elon Musk: Tesla boss on EVs with 500-mile range and colonies on Mars". Auto Express. Retrieved 2016-01-02. ^ Elon Musk interesting interview at TED. 2015-04-22 – via YouTube. ^ a b Nolan, David (2013-12-06). "Life With Tesla Model S: Electric-Draw Vampire Slain, At Last". Green Car Reports. Retrieved 2013-12-09. ^ a b Roper, L. David. "Tesla Model S Data". Retrieved 2015-04-05. ^ Musk, Elon (2013-10-04). "Model S Fire". Tesla Motors. Retrieved 2014-02-20. ^ Cunningham, Wayne (2010-10-06). "Tesla Model S: The battery pack". C|Net. Retrieved 2014-02-20. ^ Beltran, Balbino A.; Dunlap, Michael L.; Richardson, Frank D. (2013-08-07). "REPORT NUMBER: NCAP305I-KAR-13-054 NEW CAR ASSESSMENT PROGRAM (NCAP) FMVSS NO. 305 INDICANT TEST TESLA MOTORS, INC. 2013 TESLA MODEL S 5-DOOR HATCHBACK NHTSA NUMBER: MD5001" (NCAP305I-KAR–13-054). U.S. Department of Transportation, National Highway Safety Adminitstration: A-13. Archived from the original on 2014-02-26. Retrieved 2014-02-20. ^ Garthaite, Josie (2012-06-23). "Leaving Baggage on the Dock, a Flagship Departs From California". The New York Times. Retrieved 2012-06-24. ^ a b c Markus, Frank (2012-06-22). "2012 Tesla Model S First Drive". Motor Trend. Retrieved 2012-06-22. ^ Carlson, Randy (2015-03-02). "Tesla: Gigafactory Tipping Point". Seeking Alpha. Retrieved 2015-07-08. ^ Edelstein, Stephen (2015-09-24). "Tesla Model 3 Will Benefit From Lowest Battery Costs of Any Maker: Jefferies". Green Car Reports. Retrieved 2015-11-06. ^ Blankenship, George (2016-11-28). "Tesla Patent Outlines Sensible Approach to Cabin Heating". InsideEVs. Retrieved 2016-11-28. ^ Bower, George (2016). "Tesla Model S Recycles Waste Heat to Warm the Battery". insideevs.com. Retrieved 2017-07-01. Once you start driving, heat generated by the motor is used to heat up the battery. .. it might take several minutes before the battery is warm enough to provide full acceleration. ^ a b c "Model S/Options and pricing". Tesla Motors. Retrieved 2014-06-14. ^ "Service plans". Tesla Motors. Archived from the original on 2016-08-05. Retrieved 2016-08-05. ^ "Tesla Model S battery degradation shown to level off at 5% after 30,000 miles". Electrek. 2015-05-08. Archived from the original on 2015-09-10. ^ Noland, David (2015-02-17). "Tesla Model S Battery Life: How Much Range Loss For Electric Car Over Time?". Green car reports. Retrieved 2016-02-23. ^ Steinbuch, Maarten (2015-01-24). "Tesla Model S battery degradation data". Retrieved 2016-02-23. ^ Blankenship, George (2012-11-29). "2013 Model S Price Increase". Tesla Motors. Retrieved 2012-11-29. See more details in Press Release. ^ "2013 Tesla Model S (40 kW-hr battery pack)". fueleconomy.gov. Retrieved 2016-01-13. ^ "Tesla Model S Sales Exceed Target" (Press release). Tesla Motors. 2013-03-31. Retrieved 2013-04-26. ^ "Introducing the All-Wheel Drive Model-S 70D". Tesla Motors. 2015-04-08. Retrieved 2015-04-08. ^ "Tesla Motors (TSLA) Earnings Report: Q1 2015 Conference Call Transcript". TheStreet. 2015-05-07. p. 8. Archived from the original on 2015-05-11. Retrieved 2015-05-11. ^ "Tesla Motors (TSLA) Earnings Report: Q1 2015 Conference Call Transcript". TheStreet. 2015-05-07. p. 9. Archived from the original on 2015-05-11. Retrieved 2015-05-11. ^ "Model S Design Studio | Tesla Motors". my.teslamotors.com. Retrieved 2015-08-10. ^ "Model S Specs and Standards". Tesla Motors. Retrieved 2012-06-04. ^ LeVine, Steve (2015-07-21). "Why did Elon Musk pass up a chance to boast about a scientific coup?". Quartz. Retrieved 2015-07-23. ^ "Elon Musk's recent "Ludicrous" announcement hints at more synergy between Tesla and SpaceX". Electrek. Archived from the original on 2015-09-12. ^ Ayre, James (2016-02-09). "Tesla Pulls 85 kWh Battery Option From US Design Studio". evobsession.com. Retrieved 2016-03-06. ^ Hanley, Steve (2016-03-06). "Breaking News: Tesla P100D Is On The Way". gas2.org. Retrieved 2016-03-06. ^ "Tesla's vision of an all-electric car future is still years off". Retrieved 2016-08-29. ^ "Audi A3 Sportback e-tron (2017)". Retrieved 2016-09-17. ^ Hardman, Scott; Tal, Gil (2016). "Exploring the Decision to Adopt a High-End Battery Electric Vehicle: Role of Financial and Nonfinancial Motivations". Transportation Research Record: Journal of the Transportation Research Board. US. 2572: 20–27. doi:10.3141/2572-03. Retrieved 2016-09-17. ^ Musk, Elon (2015-07-17). "Three Dog Day" (Press release). Tesla Motors. ^ a b c d "2015 Tesla Model S (85 kW-hr battery pack); 2014 Tesla Model S AWD (85 kW-hr battery pack); 2015 Tesla Model S AWD – 85D; and 2015 Tesla Model S AWD – P85D". Fueleconomy.gov. U.S. Environmental Protection Agency and U.S. Department of Energy. 2015-12-30. Retrieved 2015-12-30. ^ "2014 Tesla Model S (60 kW-hr battery pack); 2014 Tesla Model S (85 kW-hr battery pack); 2014 Tesla Model S AWD (85 kW-hr battery pack)". Fueleconomy.gov. U. S. Environmental Protection Agency and U.S. Department of Energy. 2015-01-26. Retrieved 2015-01-26. ^ "2013 Tesla Model S (40 kW-hr battery pack)". ^ "2013 Tesla Model S (60 kW-hr battery pack)". www.fueleconomy.gov. Retrieved 2019-04-09. ^ "2017 Tesla Model S AWD - 100D". US Department of Energy. Retrieved 2017-11-01. ^ Hanley, Steve (2017-04-15). "Longest Range Electric Car = Tesla Model S 100D (335 Miles!)". CleanTechnica. US. Retrieved 2017-11-01. ^ a b Casey Spencer. "Tesla Model S 85D Drag Tested 28 Times" – via YouTube. ^ a b DragTimes. "How fast is the updated Tesla Model S 100D from 0-60 MPH and what is Chill Mode?" – via YouTube. ^ a b c d " "Model S". Australia: Tesla Motors. Retrieved 2015-04-01. ^ "An Update to Our Supercharging Program" (Press release). Tesla Motors. 2016-11-07. Retrieved 2017-01-02. ^ "2013 Tesla Model S (60 kWh battery pack)". Fueleconomy.gov. U. S. Environmental Protection Agency and U.S. Department of Energy. 2012-12-05. Retrieved 2012-12-07. ^ a b c d "Compare Side-by-Side – 2015 Tesla Model S 60 kWh/AWD – 70D/AWD – 90D/AWD – P90D". Fueleconomy.gov. U.S. Environmental Protection Agency and U.S. Department of Energy. 2015-12-30. Retrieved 2015-12-30. ^ a b c d e f "2016 Tesla Model S (all models)". Fueleconomy.gov. U. S. Environmental Protection Agency and U.S. Department of Energy. 2016. Retrieved 2016-12-10. ^ "2012 Tesla Model S". Fueleconomy.gov. U. S. Environmental Protection Agency and U.S. Department of Energy. 2012-06-27. Retrieved 2012-06-27. ^ "P90D Tesla cars can be upgraded to P100D – for a price". Tesla Central. 2016-08-23. Retrieved 2016-08-23. ^ a b Biello, David. "How Tesla Motors Builds One of the World's Safest Cars [Video]". Scientific American. ^ a b Ingram, Antony. "Tesla Models S Gets Highest Safety-Test Score Ever Awarded By NHTSA". Green Car Reports. ^ Tesla Model S – Charging in North America. Tesla, Inc.
^ "Tesla Model S Owner's Manual" (PDF). Tesla Motors. Archived from the original (PDF) on 2015-03-19. Retrieved 2015-07-09. ^ a b "Charge your Model S – Adapter Guide, High Power Charging, and Supercharge". Tesla Motors. Retrieved 2012-06-23. ^ Tesla Model S - Charging in Europe. Tesla, Inc.
^ New Tesla Type 2 charge port lighting. Tesla, Inc.
^ Edmunds, Dan (2012-09-26). "2012 Tesla Model S Signature Performance Suspension Walkaround". Edmunds.com. Retrieved 2015-03-21. ^ Nelson, Gabe (2014-03-28). "NHTSA closes Tesla fire inquiry as Model S gets new battery shield". Automotive News. Retrieved 2015-03-21. ^ Korosec, Kirsten (2014-09-19). "Potholes and Tesla's Model S: Never the twain shall meet". Fortunes. Retrieved 2015-03-21. ^ Isidore, Chris (2016-07-18). "Elon Musk says Autopilot upgrade could be coming". US: CNN. Retrieved 2016-07-19. ^ Musk, Elon (2016-07-17). "Twitter". Retrieved 2016-07-19. ^ Hirsch, Jerry (2015-03-19). "Elon Musk: Model S not a car but a 'sophisticated computer on wheels'". Los Angeles Times. Retrieved 2015-04-18. ^ Carmichael, Joe (2016-08-23). "When Will Elon Musk Announce Autopilot 2.0 and the Model 3 HUD?". Inverse. Retrieved 2016-09-15. ^ McMahon, Jeff (2016-08-04). "Software Is The Last Obstacle To Fully Autonomous Vehicles, Elon Musk Says". Forbes. US. Retrieved 2016-09-15. ^ a b Yadron, Danny; Tynan, Dan (2016-07-01). "Tesla driver dies in first fatal crash while using autopilot mode". The Guardian. San Francisco. Retrieved 2016-07-01. ^ a b Vlasic, Bill; Boudette, Neal E. (2016-06-30). "Self-Driving Tesla Involved in Fatal Crash". The New York Times. Retrieved 2016-07-01. ^ Morris, David Paul (2016-07-01). "Highway patrol found DVD player in wreckage of fatal Tesla accident". CNBC. Associated Press. Retrieved 2016-07-01. ^ "ODI Resume - Investigation: PE 16-007" (PDF). U.S.: Office of Defects Investigations, National Highway Traffic Safety Administration (NHTSA). 2016-06-28. Retrieved 2016-07-02. ^ "A Tragic Loss" (Press release). Tesla Motors. 2016-06-30. Retrieved 2016-07-01. ^ "Fatal Tesla Autopilot accident investigation ends with no recall ordered". The Verge. 2017-01-19. Retrieved 2017-01-19. ^ "PE 16-007. MY2014-2016 Tesla Model S and Model X" (PDF). NHTSA. 2017-01-19. Retrieved 2017-06-07. ^ Dec 21, CBC News · Posted:; December 23, 2015 11:24 PM CT | Last Updated:; 2015. "Man, 67, dies after car collides with dump truck in Winnipeg | CBC News". CBC. Retrieved 2018-12-15. 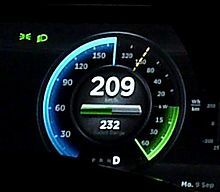 ^ "NVIDIA Powers Digital Dashboard in New Tesla Motors Electric Sedan" (Press release). NVidia. 2012-06-21. Archived from the original on 2012-06-25. Retrieved 2013-01-14. ^ Hesseldahl, Arik. "What's Inside the Tesla Model S Dashboard". Re/code. ^ "Visual Computing Module" (Press release). NVIDIA. Retrieved 2013-01-14. ^ Olsen, Stein Jarle (2015-03-19). "Tesla Model S – Slik vil Tesla gjøre slutt på rekkeviddeangsten" [Tesla Model S – How will end the Tesla range anxiety]. Teknisk Ukeblad (in Norwegian). Retrieved 2015-04-06. ^ "2015 Annual Shareholder Meeting" (Press release). Tesla Motors. Archived from the original on 2015-04-28. ^ "Tesla Model S owners hack their cars, find Ubuntu". Autoblog. 2014-04-12. Retrieved 2015-07-16. ^ a b c d Shenhar, Gabe (2013-03-19). "Our Tesla Model S gets a third-row seat and now seats seven". Consumer Reports. Retrieved 2013-05-12. ^ "Elon Musk Reveals the Car of the Future, and It Is Glorious". Inc.com. Associated Press. 2014-10-10. Retrieved 2015-03-21. ^ Cantle, Chris. "Tesla Model S P85D: Dual motors, AWD, 691 hp, 3.2 to 60". Road & Track. Retrieved 2015-04-18. ^ Dow, Jameson (2016-11-04). "Tesla adds new "Glass Roof" Model S option; discontinues P90D". Electrek. Retrieved 2016-11-04. ^ "Tesla Model S now in production". DesignBoom. 2012-06-27. Retrieved 2012-06-27. ^ "Tesla Model S Specs and Standard Features". ^ a b "Tesla Service". Tesla Motors. Retrieved 2012-12-14. ^ a b Musk, Elon (2013-04-26). "Tesla Blo – Creating the World's Best Service and Warranty Program". Tesla Motors. Retrieved 2012-12-14. ^ a b "Model S new vehicle limited warranty for North America" (PDF). Tesla. 2015. p. 3. Retrieved 2015-03-12. ^ Valdes-Dapena, Peter (2013-04-26). "Tesla offers idiot-proof battery warranty". CNN. Retrieved 2013-07-25. ^ "Model S Quick Guide" (PDF). Tesla. 2013. Retrieved 2014-04-01. ^ Amarakoon, Shanika; Smith, Jay; Segal, Brian (2013-04-24). "Application of Life Cycle Assessment to Nanoscale Technology: Lithium-ion Batteries for Electric Vehicles" (PDF). Design for the Environment Program/Office of Research and Development. United States Environmental Protection Agency. Retrieved 2017-06-17. ^ Westervelt, Amy (2015-06-10). "Tesla's new batteries may be harder on the environment than you think". The Guardian. ^ a b "Tesla's Closed Loop Battery Recycling Program". Tesla Motors. 2011-01-26. Retrieved 2016-10-18. ^ "Mythbusters Part 3: Recycling our Non-Toxic Battery Packs". teslamotors.com. 2008-03-11. Archived from the original on 2015-05-05. ^ Spence, Katie (2014-02-09). "Will Battery Recycling Help Tesla Motors' Massive Shortcoming?". fool.com. Archived from the original on 2014-08-19. ^ "The Electric Vehicle Battery 'Can And Should Be Recycled'". CleanTechnica. 2015-07-23. ^ a b c Nealer, Rachael; Reichmuth, David; Anair, Don (November 2015). "Cleaner Cars from Cradle to Grave: How Electric Cars Beat Gasoline Cars on Lifetime Global Warming Emissions" (PDF). Union of Concerned Scientists (UCS). Retrieved 2014-11-22. ^ Loveday, Eric (2014-02-11). "Nissan LEAF Has Smallest Lifecycle Footprint of Any 2014 Model Year Automobile Sold in North America". Inside EVs. Retrieved 2014-02-22. ^ "Life-cycle Assessment of 1,300 Models Reveals Best of 2014" (Press release). Automotive Science Group (ASG). 2014-02-04. Retrieved 2016-03-31. ^ Anair, Don; Mahmassani, Amine (June 2012). "State of Charge: Electric Vehicles' Global Warming Emissions and Fuel-Cost Savings across the United States" (PDF). Union of Concerned Scientists (UCS). Retrieved 2017-06-17. ^ Blanco, Sebastian (2015-11-17). "UCS: Well-to-wheel, EVs cleaner than pretty much all gas cars". Autoblog (website). Retrieved 2015-11-22. ^ a b c d "Home charging installation". Tesla.com. Tesla Motors. Retrieved 2017-06-04. ^ a b c "Home charging installation". Tesla UK. Tesla Motors. Retrieved 2017-06-04. ^ "Installation der Lademöglichkeiten zu Hause" [Home charging installationwork=Tesla Deutschland] (in German). Tesla Motors. Retrieved 2017-06-04. ^ Lambert, Fred (2017-04-15). "Tesla expands its Destination Charging network to over 5,000 locations". electrek. 9to5 Network. Retrieved 2017-06-04. ^ Field, Kyle (2016-04-29). "Tesla Makes Full-Court Press With Destination Charging". Clean Technica. Sustainable Enterprises Media. Retrieved 2017-06-04. ^ "Tesla CHAdeMO Adapter". Tesla Gear. Tesla Motors, Inc. Archived from the original on 2017-04-07. Retrieved 2017-06-04. ^ "Supercharger | Tesla". www.tesla.com. Archived from the original on 2017-06-04. Retrieved 2017-06-04. ^ Golson, Jordan (2017-04-24). "Tesla is making a big expansion to its Supercharger network". The Verge. Vox Media. Retrieved 2017-06-04. ^ Kane, Mark (2014-11-13). "Supercharging Tesla Model S 60 kWh Versus 85 kWh - Video + Graphs". Inside EVs. US. Retrieved 2016-08-20. ^ Godske, Bjørn (2014-10-12). "Tesla gør Køge til knudepunkt for hurtigopladning" [Tesla makes Køge a hub for fast charging] (in Danish). Ingeniøren. Retrieved 2015-03-12. ^ a b "Tesla launches first six Supercharger locations; 100 kW charging, with 120 kW in future". Green Car Congress. 2012-09-25. Retrieved 2012-12-23. ^ a b Cobb, Jeff (2012-10-12). "First Tesla Superchargers Open October 19". HybridCars.com. Retrieved 2012-12-23. ^ a b Motavalli, Jim (2012-12-21). "Tesla Begins East Coast Fast-Charging Corridor". The New York Times. Retrieved 2012-12-23. ^ a b c "Tesla Motors, Inc. – Third Quarter 2013 Shareholder Letter" (PDF). Tesla Motors. 2013-11-05. Retrieved 2013-11-06. ^ "Tesla Supercharger: An In-Depth Look". Motor Trend. Retrieved 2013-04-01. ^ "Supercharger". Tesla Motors. Retrieved 2015-07-28. ^ "Model S Tesla Motors". Tesla Motors. Retrieved 2015-05-17. ^ a b Kane, Mark (2013-08-30). "First Six Tesla Supercharger Stations Up And Runing(sic) in Norway; ~ 120 kW of Power". InsideEVs.com. Retrieved 2013-09-01. ^ Blanco, Sebastian (2009-09-27). "Report: Tesla Model S was designed with battery swaps in mind". Autoblog Green. Retrieved 2013-06-22. ^ a b Rogowsky, Mark (2013-06-21). "Tesla 90-Second Battery Swap Tech Coming This Year". Forbes. Retrieved 2013-06-22. ^ a b Sorokanich, Robert. "Musk: Tesla "unlikely" to pursue battery swapping stations". Road & Track. ^ Cunningham, Wayne (2014-12-19). "Tesla tentatively tests battery swap plan". CNET. Retrieved 2014-12-20. ^ "Tesla Motors (TSLA) Earnings Report: Q1 2015 Conference Call Transcript". TheStreet. 2015-05-07. p. 2. Archived from the original on 2015-05-11. Retrieved 2015-05-11. ^ Smith, John (2016-01-27). "First hybrid taxi arrives in Gibraltar". EuroWeekly News. Retrieved 2018-08-04. ^ Ingram, Antony (2012-06-04). "Want A 2013 Tesla Model S Signature Edition? Too Late, They're All Gone". Green Cars Reports. Retrieved 2012-06-21. ^ Garthwaite, Josie (2011-05-06). "Tesla Prepares for a Gap as Roadster Winds Down". The New York Times. Retrieved 2011-05-07. ^ "First Tesla Model S Convertible Hits the Streets of San Francisco". TESLARATI.com. 2014-09-24. Retrieved 2016-03-22. ^ ABC video Quote:" One thing it doesn't make, is a convertible"
^ "520 Model S Reserved in the First Week". Business Wire. 2009-04-01. Retrieved 2012-06-25. ^ Lienert, Anita (2012-06-04). "2013 Tesla Model S Signature Series Is Sold Out". Edmunds Inside Line. Retrieved 2012-06-25. ^ Motavalli, Jim (2012-05-12). "In White Plains, Tesla Motors Sells the Sizzle and Maybe a Car or Two". The New York Times. Retrieved 2012-06-25. ^ "Tesla Motors, Inc. – Third Quarter 2014 Shareholder Letter" (PDF). Tesla Motors. 2014-11-05. Retrieved 2014-11-05. Global sales during 3Q 2014 Totaled 7,785 units. ^ a b "Tesla Motors – Third Quarter 2015 Shareholder Letter" (PDF) (Press release). Palo Alto, California: Tesla Motors. 2015-11-03. Retrieved 2015-11-03. Tesla global electric car sales totaled 11,603 units during the third quarter of 2015, including six Model X units. ^ a b c d e f g h i j "Tesla Fourth Quarter & Full Year 2015 Update" (PDF). Tesla Motors. 2016-02-10. Retrieved 2016-02-10. A total of 17,478 units were delivered globaly during the fourth quarter of 2015, including 206 Model X vehicles. Model S sales in the United States totaled 16,689 units in 2014 and 25,202 in 2015. ^ "Tesla Model S & Nissan LEAF Clocked As World's Best-Selling Electric Cars In 2016". Retrieved 27 November 2018. ^ Cole, Jay (2012-12-04). "Tesla 60 kWh Model S Deliveries Delayed To January–February, Entry Level Until March–April". Inside EVs. Retrieved 2012-12-07. ^ Yoney, Domenick (2013-02-20). "Tesla delivered 2,650 Model S EVs last year, Musk confident of profit in Q1 and beyond". Autoblog Green. Retrieved 2013-03-10. ^ a b Ohnsman, Alan (2013-05-08). "Tesla Posts First Quarterly Profit on Model S Deliveries". Bloomberg News. Archived from the original on 2013-10-04. Retrieved 2013-05-08. ^ a b c "Tesla Motors, Inc. – Second Quarter 2013 Shareholder Letter" (PDF). Tesla Motors. 2013-08-07. Retrieved 2013-08-07. ^ a b Hirsch, Jerry (2014-02-19). "Tesla Motors ends year with higher sales but still a big loss". Los Angeles Times. Retrieved 2014-02-19. A total of 22,477 Model S sedans were sold in 2013. ^ a b Ohnsman, Alan (2014-01-14). "Tesla Rises After Model S Sales in 2013 Exceed Forecast". Bloomberg News. Retrieved 2014-01-15. ^ Hull, Dana (2013-02-14). "Elon Musk vs The New York Times: battle escalates Thursday with dueling blog posts". San Jose Mercury News. Retrieved 2014-09-15. ^ a b Julie Makinen (2014-04-22). "Tesla delivers its first electric cars in China; delays upset some". Los Angeles Times. Retrieved 2014-04-22. ^ a b Loveday, Eric (2014-06-07). "First Right Hand Drive Tesla Model S EVs Get Delivered in UK". InsideEVs.com. Retrieved 2014-06-08. ^ a b Eric Loveday (2014-07-30). "Tesla Celebrates First Model S Deliveries in Hong Kong – Video". InsideEVs.com. Retrieved 2014-07-30. ^ Mochizuki, Takashi (2014-09-08). "Tesla's Musk, in Tokyo, Says 'Heart' of Model S Is Japanese". The Wall Street Journal. Retrieved 2014-09-08. ^ Crowe, Philippe (2014-12-09). "Tesla Officially Open For Business in Australia". HybridCars.com. Retrieved 2014-12-09. ^ Cobb, Jeff (2015-06-16). "Tesla Due To Sell 75,000th Model S This Month". HybridCars.com. Retrieved 2015-06-17. ^ a b Cobb, Jeff (2015-02-11). "2014's Top-10 Global Best-Selling Plug-in Cars". HybridCars.com. Retrieved 2015-02-11. A total of 31,655 units were sold worldwide in 2014. Global cumulative sales since June 2012 totaled 56,782 Model S cars by the end of 2014. ^ "Tesla Motors – Fourth Quarter & Full Year 2014 Shareholder Letter" (PDF). Tesla Motors. 2014-02-11. Retrieved 2014-02-11. Global sales during 4Q 2014 totaled 9,834 units. ^ a b "Tesla Motors – Second Quarter 2015 Shareholder Letter" (PDF). Tesla Motors. 2015-08-05. Retrieved 2015-08-05. A total of 11,532 units were delivered globally during the second quarter of 2015. The Model S was the best-selling electric vehicle in the U.S for the first half of 2015. ^ Cobb, Jeff (2015-07-02). "Tesla Model S Is Top-Selling Plug-in Car For First Half of 2015". HybridCars.com. Retrieved 2015-07-02. An estimated 11,900 Model S sedans were sold in the U.S. during the first half of 2015, and as of June 2015[update], global cumulative Model S sales totaled over 78,300 units sold through June 2015. ^ "Tesla Motors – First Quarter 2015 Shareholder Letter" (PDF). Tesla Motors. 2015-05-06. Retrieved 2015-05-21. A total of 10,045 units were delivered globaly during the first quarter of 2015. ^ "Tesla Delivers 17,400 Vehicles in Q4 2015; Total 2015 Deliveries Were 50,580" (Press release). Palo Alto, California: Market Wired. 2016-01-03. Retrieved 2016-01-08. ^ a b c d e Cobb, Jeff (2016-01-12). "Tesla Model S Was World's Best-Selling Plug-in Car in 2015". HybridCars.com. Retrieved 2016-01-13. ^ a b c d Cobb, Jeff (2014-01-06). "December 2013 Dashboard". HybridCars.com and Baum & Associates. Retrieved 2015-07-06. An estimated 18,650 Model S sedans were sold in the U.S. in 2013, and about 2,620 in 2012. See section "December 2013 Plug-in Electric Car Sales Numbers"
^ a b Young, Angelo (2014-08-14). "Tesla in Norway: 436 Model S Sedans Are Being Delivered Monthly In Tesla's Largest Overseas Market". International Business Times. Retrieved 2014-09-15. ^ a b c "Bilsalget i desember og hele 2013" [Car sales in December and during 2013] (in Norwegian). Opplysningsrådet for Veitrafikken AS (OFV, Norwegian Road Federation). January 2014. Archived from the original on 2014-01-04. Retrieved 2014-07-31. ^ a b c d "Bilsalget i 2014" [Car sales in 2014] (in Norwegian). Opplysningsrådet for Veitrafikken AS (OFV, Norwegian Road Federation). January 2015. Retrieved 2015-02-12. Click on "Modellfordelt" to display the top 20 selling new cars in Norway: A total of 4,040 Model S cars were sold in 2014, representing a 2.8% market share of new car sales in the country. ^ a b c d "Bilsalget i desember" [Car sales in December] (in Norwegian). Opplysningsrådet for Veitrafikken AS (OFV, Norwegian Road Federation). January 2016. Retrieved 2016-02-03. A total of 4,039 new Model S cars were registered in Norway in 2015. ^ a b c d "Tesla cutting 30% of staff in China". Want China Times. 2015-03-07. Archived from the original on 2015-03-08. Retrieved 2015-03-09. Tesla imported 4,800 Model S cars in 2014, but only 2,499 of those vehicles were registered for road use in China. ^ "Cijfers elektrisch vervoer – Top 10 geregistreerde modellen volledig elektrische auto (31-12-2015)" [Figures electric transport – Top 10 registered fully electric vehicle models] (PDF). Rijksdienst voor Ondernemend Nederland (RVO) - Dutch National Office for Enterprising - (in Dutch). BovagWebsite. 2015-12-31. Retrieved 2017-01-24. ^ a b c "Tesla Delivers 14,820 Vehicles in Q1 2016; On Track for Full-Year Delivery Guidance". Tesla Motors (Press release). Palo Alto: Market Wired. 2016-04-04. Retrieved 2016-04-04. ^ a b c "Tesla second Quarter 2016 Update" (PDF) (Press release). Palo Alto: Tesla Motors. 2016-08-03. Retrieved 2016-08-03. During the second quarter of 2016 Tesla Motors delivered 14,402 new vehicles consisting of 9,764 Model S and 4,638 Model X. Production during 2Q 2016 totaled 18,345 vehicles. ^ "Tesla Q2 2016 Vehicle Production and Deliveries" (Press release). Palo Alto: Tesla Motors. 2016-07-03. Retrieved 2016-07-03. ^ a b "Tesla Third Quarter 2016 Update" (PDF). Tesla Motors. Palo Alto. 2016-10-26. Retrieved 2016-10-27. ^ Kane, Mark (2016-11-05). "World's Top 10 Selling EVs Led By The Tesla Model S After Strong September". EV Sales Blog. InsideEVs.com. Retrieved 2016-11-06. ^ a b "Tesla Q4 2016 Production and Deliveries". Tesla Motors (Press release). Palo Alto: Market Wired. 2017-01-03. Retrieved 2017-01-04. Tesla delivered approximately 22,200 vehicles in Q4, of which 12,700 were Model S and 9,500 were Model X. ^ a b c Schmitt, Bertel (2017-03-04). "Tesla's Sudden Chinese Billion, Where Are The Cars Behind It?". Forbes. Retrieved 2017-03-06. ^ Schmitt, Bertel (2017-03-07). "The Tesla China Numbers That Elon Musk Won't Tell You". Forbes. Retrieved 2017-03-07. Norway was the largest Model S overseas market in 2015, and China ranked as Tesla's most important market behind the U.S. in 2016. ^ Cobb, Jeff (2017-01-09). "Nissan's Quarter-Millionth Leaf Means It's The Best-Selling Plug-in Car In History". HybridCars.com. Retrieved 2017-01-10. As of December 2016[update], the Nissan Leaf is the world's best-selling plug-in car in history with more than 250,000 units delivered, followed by the Tesla Model S with over 158,000 sales, the Volt/Ampera family of vehicles with 134,500 vehicles sold. ^ "Tesla Q1 2017 Vehicle Production and Deliveries". Tesla Motors (Press release). Palo Alto: Market Wired. 2017-04-02. Retrieved 2017-04-04. Tesla (NASDAQ: TSLA) delivered just over 25,000 vehicles in Q1, of which approx 13,450 were Model S and approx 11,550 were Model X. ^ "Update – Tesla Q2 2017 Vehicle Production and Deliveries". Tesla Motors (Press release). Palo Alto. 2017-07-07. Retrieved 2017-08-04. Tesla (Nasdaq:TSLA) delivered just over 22,000 vehicles in Q2, of which just over 12,000 were Model S and just over 10,000 were Model X. ^ "Tesla Q3 2017 Vehicle Deliveries and Production". Tesla. 2017-10-04. Retrieved 2017-10-06. ^ "Tesla Q4 2017 Vehicle Production and Deliveries". Tesla. 2018-01-03. Retrieved 2018-01-23. ^ a b c d e Cobb, Jeff (2018-01-04). "December 2017 Dashboard". HybridCars.com and Baum & Associates. Retrieved 2018-01-23. ^ a b c d "Tesla Fourth Quarter 2018 Delivery". Palo Alto: Tesla. 2019-01-05. Retrieved 2019-01-09. ^ a b Dobush, Grace (2018-08-01). "Why Tesla Is Investing $5 Billion in a New China Factory, Its First Outside the U.S." Fortune. Retrieved 2019-01-28. ^ Holter, Mikael (2019-01-26). "Tesla doubles service staff in key Norway market to address customer frustration". Bloomberg. Automotive News Europe. Retrieved 2019-01-28. The Nordic country has become the California-based carmaker’s third-biggest market. ^ a b Norwegian Road Federation (OFV) (January 2017). "Bilsalget i 2016" [Car sales in 2016] (in Norwegian). Archived from the original on 2017-01-18. Retrieved 2017-01-25. Tesla Model S registrations in Norway totaled 2,051 new units in 2016. ^ a b c Opplysningsrådet for Veitrafikken AS (OFV). "Bilsalget i 2017" [Car sales in 2017] (in Norwegian). Retrieved 2018-01-23. ^ Norwegian Road Federation (OFV) (2019-01-02). "Bilsalget i 2018" [Car sales in 2018] (in Norwegian). OFV. Retrieved 2019-01-09. ^ a b "Verkoopstatistieken – Meer marktinformatie" [Sales Statistics – More Market Information] (in Dutch). RAI Vereniging. 2014-01-24. Archived from the original on 2014-06-25. Retrieved 2014-06-08. Download pdf file for detailed sales in 2013 ("Download nieuwverkoop personenautos 201312"). ^ "Verkoopstatistieken" [Sales Statistics] (PDF) (in Dutch). RAI Vereniging. 2015-01-27. Archived from the original (PDF) on 2015-07-09. Retrieved 2015-01-31. Download the pdf file for detailed sales by model during 2014: "nieuwverkoop personenautos 201412 Archived 2015-02-01 at the Wayback Machine". ^ a b "Nieuwverkoop Personenautos Per Merk/Model" [New passenger cars sales by brand/model] (in Dutch). RAI Vereniging. January 2016. Archived from the original on 2016-03-06. Retrieved 2016-02-28. A total of 1,805 Model S cars were sold in the Netherlands in 2015". ^ a b "RAI BOVAG Persbericht Verkopen Personenauto's" [RAI BOVAG Press Release car sales] (PDF) (in Dutch). =RAI Vereniging. January 2017. Retrieved 2017-03-08. A total of 1,693 Model S cars were sold in the Netherlands in 2016." ^ "Maandelijkse verkoopcijfers" [Monthly sales figures] (in Dutch). RAI Vereniging. 2018-01-22. Retrieved 2018-01-28. Download the XLS file "Personenauto's maandrapportage nieuwverkopen 2017" – A total of 2,051 Model S cars were sold in the Netherlands in 2017." ^ RAI Vereniging (2019-01-07). "Maandelijkse verkoopcijfers" [Monthly sales figures] (in Dutch). RAI. Retrieved 2019-01-14. Download the XLS file "Personenauto's maandrapportage nieuwverkopen 2018" - A total of 1,613 i3 cars were sold in the Netherlands in 2018." ^ a b Klippenstein, Matthew (January 2018). "Canadian Plug-in Electric Vehicle Sales". Green Car Reports. Retrieved 2018-01-31. Tesla Model S sales figures from IHS data. ^ a b "Neuzulassungen von Personenkraftwagen 2013 nach Herstellern, Handelsnamen und ausgewählten Merkmalen" [New registrations of passenger cars 2013 by manufacturers, trade names and selected characteristics] (PDF). Statistische Mitteilungen des Kraftfahrt-Bundesamtes FZ 4, Jahr 2013 (in German). Kraftfahrt-Bundesamt (KBA). May 2014. Retrieved 2015-04-13. A total of 183 units were registered in Germany in 2013. ^ a b c "Neuzulassungen von Personenkraftwagen nach Segmenten und Modellreihen im Dezember 2014" [New registrations of passenger cars by segments and models in December 2014] (PDF) (in German). Kraftfahrt-Bundesamt (KBA). January 2015. Archived from the original (PDF) on 2015-02-05. Retrieved 2015-02-08. A total of 815 units were registered in Germany in 2014. ^ a b "Neuzulassungen von Personenkraftwagen im Dezember 2016 nach Segmenten und Modellreihen" [New registrations of passenger cars in December 2016 by segments and models] (PDF) (in German). Kraftfahrt-Bundesamt (KBA). January 2017. Retrieved 2017-03-08. A total of 1,474 Model S cars were registered in Germany in 2016. ^ Bekker, Henk (2018-01-09). "2017 (Full Year) Germany: Best-Selling Electric Car Brands and Models". best-selling-cars.com. Retrieved 2018-01-23. ^ Kraftfahrt-Bundesamt (KBA) (January 2019). "Neuzulassungen von Personenkraftwagen nach Segmenten und Modellreihen im Dezember 2018 (FZ 11) (xlsx, 75 KB, Datei ist nicht barrierefrei)" [New registrations of passenger cars by segments and models in December 2018] (in German). KBA. Retrieved 2019-01-14. Click on the link Neuzulassungen von Personenkraftwagen nach Marken und Modellreihen im Dezember 2018 (FZ 11) (xlsx, 75 KB, Datei ist nicht barrierefrei) to download the file with registrations figures by model. ^ "Plug-in grant eligible vehicles licensed (at the end of Q3 2017)". UK: RAC Foundation. January 2018. Retrieved 2018-02-06. This figure corresponds to eligible vehicles for the plug-in car and van grant schemes as licensed in the UK at the end of Q2 2017 (not cumulative sales). ^ "Plug-in grant eligible vehicles licensed (at the end of Q1 2016)". UK: RAC Foundation. Retrieved 2016-06-07. Figures correspond to the number of vehicles registered at the end of the corresponding quarter. ^ Lilly, Chris (2015-09-17). "Outlander PHEV tops ultra-low emission league table as plug-in sales soar". Next Green Car. Retrieved 2015-09-24. A total of 1,047 Model S cars were registered in the UK at the end of June 2015. ^ a b "Plug-in grant eligible vehicles licensed (at the end of Q3 2016)". UK: RAC Foundation. March 2017. Retrieved 2017-03-09. A total of 3,907 Model S cars were registered in the UK at the end of September 2016. ^ a b c "Autoverkäufe nach Modellen – Modellstatistik" [Passenger cars by model – Statistics by model] (in German). Auto Schweiz Suisse. Retrieved 2018-01-28. Under "Modellstatistik Januar - Dezember 2017" download the xls file for 2017 sales, under "Modellstatistiken 2011–2016" download the xls file "ModellePW2016" for 2016 sales, click "2015 Statistik" to download the file "ModellePW2015" with sales by model for 2015, "2014 Statistik" to download the file "ModellePW2014" with sales by model for 2014, and "2013 Statistik" to download the file "ModellePW2013" with sales by model for 2013. ^ a b c "Statistik – Nyregistreringstal – Personbiler – Pr.model: januar–juni 2016" [Statistics – Passenger cars by model: January–June 2015] (in Danish). Bilimp. July 2016. Archived from the original on 2013-05-08. Retrieved 2016-08-09. "Select "2015 or 2014 or 2013 – Hele året" for the corresponding year and click on "Pr. model" for details of sales by brand and model. ^ a b "Bilsalget i december samt hele 2016" [Car sales in December and throughout 2016] (in Danish). Bilimp. 2017-01-03. Retrieved 2017-03-08. Download the file "12-2016.xls" and click on the tab "Pressemeddelelse"
^ "ÅRETS BILSALG 2017" [Car sales 2017] (in Danish). Bilimp. 2018-01-08. Retrieved 2018-01-28. Download the file "12-2017.xls" and click on the tab "Pressemeddelelse"
^ "Topplistan december 2014 (def)" [Highscore in December 2014 (definitely)] (PDF) (in Swedish). Bil Sweden. 2015-01-06. Archived from the original (PDF) on June 26, 2015. Retrieved 2015-04-13. ^ "Nyregistrerade miljöbilar december 2016 (def)" [New Registrations Super Green car December 2016 (final)] (in Swedish). Bil Sweden. 2017-01-04. Retrieved 2017-03-10. Download the file "Nyregistrerade miljöbilar december 2016 (def)". ^ "Definitiva nyregistreringar under 2017" [Definitive new registrations in 2017] (in Swedish). Bil Sweden. 2018-01-08. Retrieved 2018-01-28. Download the pdf file "PressRel1712_DEF.pdf" See table: "Nyregistrerade supermiljöbilar december 2017"
^ Bil Sweden (2019-01-07). "Nyregistreringar december 2018 (def)" [Definitive new registrations December 2018 (final)] (in Swedish). Bil Sweden. Retrieved 2018-01-20. Download the pdf file "PressRel1812_DEF.pdf" See table: "Nyregistrerade laddbara personbilar december 2018"
^ Torregrossa, Michaël (2014-01-15). "Tesla Model S – Plus de 22.000 ventes dans le monde en 2013" [Tesla Model S – More than 22,000 sales worldwide in 2013] (in French). Association pour l'Avenir du Véhicule Electrique Méditerranéen (AVEM). Retrieved 2015-02-12. A total of 15 units were registered in France in 2013. ^ "Chiffres de vente & immatriculations de voitures électriques en France" [Sales figures & electric car registrations in France] (in French). Automobile Propre. January 2017. Retrieved 2017-03-10. See "Ventes de voitures électriques" in 2016, 2015, 2014 and 2013. It shows all-electric car registrations between 2010 and 2016. A total of 785 Model S cars were registered in 2016, 708 in 2015 and 328 in 2014. ^ "Près de 31 000 véhicules électriques immatriculés en France en 2017 !" [Nearly 31,000 electric vehicles registered in France in 2017!] (in French). France: France Mobilité Électrique - AVERE. 2018-01-09. Retrieved 2018-01-23. ^ France Mobilité Électrique - AVERE France (2019-01-09). "Baromètre annuel : près de 40 000 véhicules électriques immatriculés en France en 2018 !" [Annual barometer: nearly 40,000 electric vehicles registered in France in 2018!] (in French). AVERE. Retrieved 2019-01-28. ^ Pontes, Jose (2014-01-18). "Belgium December 2013". EV Sales. Retrieved 2014-01-25. ^ "Immatriculations de Voitures Neuves Par Marque – December 2015" [New Car Registrations per Brand – December 2015] (PDF) (in French). Fédération Belge De L´Autombile Et Du Cycle (FEBIAC). January 2016. Retrieved 2016-01-19. See in the left side cumulative sales for 2015 (820) and 2014 (521). ^ Pontes, Jose (2017-01-24). "Belgium December 2016". EV Sales. Retrieved 2017-03-10. ^ Pontes, Jose (2018-01-04). "Belgium December 2017". EV Sales. Retrieved 2018-01-28. ^ Jose Pontes (2019-01-04). "Belgium December 2018". EV Sales. Retrieved 2019-02-02. ^ a b Soo, Zen (2016-01-25). "With Tesla's Model S now Hong Kong's top-selling sedan, chief Elon Musk predicts city to become world leader in electric vehicles". South China Morning Post. Retrieved 2016-02-02. ^ "Bundesländer-Statistik – Dezember 2015" [Federal Statistics – December 2015] (in German). Myampera.wordpress.com. August 2016. Retrieved 2016-08-12. Click on the tables by model by year. ^ "Neuzulassungen nach Jahren" [Registrations by year] (in German). Statistik Austria. January 2015. Retrieved 2015-02-12. Download the pdf file "Kfz-Neuzulassungen Jänner bis Dezember 2014" for Tesla's monthly sales during 2014. ^ "BEV Overview table – Austria". European Alternative Fuels Observatory. March 2017. Retrieved 2017-03-10. Filter by country Austria. ^ Pontes, Jose (2018-01-17). "Austria December 2017". EV Sales. Retrieved 2018-01-28. ^ Gasnier, Mat (2016-01-12). "Australia Full Year 2015: Mazda first full importer to #2 in record market". Best Selling Cars Blog. Retrieved 2016-01-18. Model S deliveries estimated at 1,250 units in 2015. ^ David McCowen (2015-05-26). "Why the Tesla is Australia's best-selling electric car". Drive. Retrieved 2016-01-18. There were 65 Tesla Model S registered in New South Wales at the end of 2014, and 4 in Victoria. ^ "BEV Overview table - Italy". European Alternative Fuels Observatory. March 2017. Retrieved 2017-03-10. Filter by country Italy. ^ Luca Moroni (2018-01-06). "Dados para a venda de carros elétricos na Itália em dezembro de 2017" [Electric car salles data in Italy in December 2017] (in Italian). Green Start. Retrieved 2018-01-28. ^ "Tesla CHAdeMO Adapter". Archived from the original on 2017-04-07. ^ Philippe Crowe (2014-12-09). "Tesla Officially Open For Business in Australia". HybridCars.com. Retrieved 2015-07-14. ^ Eric Loveday (2014-12-10). "Tesla Model S Launches in Australia; First Australian Supercharger Comes Online". InsideEVs.com. Retrieved 2015-07-14. ^ a b David McCowen (2015-05-26). "Why the Tesla is Australia's best-selling electric car". Drive. Retrieved 2015-07-13. ^ Ucilia Wang (2013-11-05). "Tesla Makes Record Delivery of Model S, Promises A 'Pioneering Approach' To Servicing Its Cars". Forbes. Retrieved 2013-11-05. Over 5,500 units delivered during 3Q 2013. ^ Eric Loveday (2014-01-23). "Tesla Model S 85 kWh 'Fairly Priced' From $121,000 in China". InsideEVs.com. Retrieved 2014-01-23. ^ Alan Ohnsman (2014-07-30). "Tesla Seen Reporting Record Deliveries on China Expansion". Bloomberg News. Retrieved 2014-07-31. Sales in China up to June 2014 are estimated at about 1,000 units by Barclays analysts. ^ a b Charles Fleming (2014-09-26). "Are Teslas disappearing in China?". Los Angeles Times. Retrieved 2014-10-16. Estimates by JLWarren Capital. ^ Sarita Pereira (2014-10-16). "Tesla Motors: The Road To China Is Getting Harder". Seeking Alpha. Retrieved 2014-10-17. ^ Angelo Young (2015-03-16). "Tesla Motors Inc in China: Hundreds Of Model S Cars Sent To China Are Unsold, According To 'Insiders'". International Business Times. Retrieved 2015-06-15. CEO Elon Musk has admitted the Model S isn't selling as well as expected. ^ Staff (2015-08-06). "Tesla sells well in China but Q2 report indicates losses". Greentech Leaf. Retrieved 2015-08-06. ^ Xiang, Nina (2016-12-09). "After Three Years In China: What Are Tesla's Hits And Misses?". China Money Network. Retrieved 2016-12-09. ^ Lambert, Fred (2016-09-05). "Tesla has 80% market share of Hong Kong's growing electric vehicle market, German automakers are not happy". Electrek. Retrieved 2016-09-06. ^ a b Angelo Young (2014-09-02). "Tesla Motors' Tesla Model S Is Outselling Nissan Leaf in Northern European Markets". International Business Times. Retrieved 2014-09-21. ^ a b Neil Winton (2014-02-06). "Electric Car Sales in Western Europe Spurt, But From Miniscule Base". Forbes. Retrieved 2014-02-16. Sales figures based on Automotive Industry Data (AID). About 3,900 Tesla Model S cars were sold in Europe in 2013..
^ Pontes, Jose (2014-01-26). "Europe December 2013". EVSales.com. Retrieved 2014-02-16. The Tesla Model S ranked as the third best selling all-electric passenger car and as the seventh among highway-capable plug-in electric vehicles..
^ a b c "Nissan LEAF is the best-selling electric car in Europe for fourth year in a row" (Press release). Rolle, Switzerland: Nissan Europe. 2015-01-19. Retrieved 2015-02-08. ^ Jeremy Bennett (2014-10-17). "New cars: Europe's recovery continues – JATO". Automotive Management online. Retrieved 2014-10-31. ^ a b Association Nationale pour le Développement de la Mobilité Electrique (2016-03-24). "Quelle est la place de la France sur le marché européen du véhicule électrique ?" [What is the place of France in the European electric vehicle market] (in French). AVERE France. Retrieved 2016-03-27. A total of 97,687 all-electric vehicles were registered in the European market in 2015. The top selling electric cars were the Renault Zoe (18,727), the Tesla Model S (15,515), and the Nissan Leaf (15,455). ^ Automotive Industry Data (AID) (2016-04-01). "Tesla's Model S outsold Mercedes S-Class in Europe last year". AID Newsletter. Retrieved 2016-04-07. During 2015 Tesla Models S sales in Western Europe totaled 15,787 units, while Mercedes-Benz S-Class sales totaled 14,990 units. ^ Kreč, Luboš; Skoupá, Adéla (2015-04-10). "Drahým autům se v Česku daří. Lamborghini chce prodávat 15 vozů ročně" [Expensive cars in the Czech Republic. Lamborghini wants to sell 15 cars a year]. Hospodářské noviny (in Czech). Retrieved 2015-04-13. ^ Eric Loveday (2013-10-09). "Tesla Model S Soars to Top of EV Sales Chart in Denmark". InsideEVs.com. Retrieved 2013-10-11. ^ Kurt Hedevang (2014-02-11). 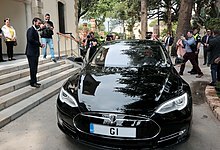 "Tesla spurter fra luksusbilerne" (in Danish). Jyllandsposten. Retrieved 2014-08-16. ^ Larsen, Lars-Bo (2014-08-16). "Forsøg med eltaxa stopper" [Trial ends for electric taxi]. Politiken. Archived from the original on 2014-09-18. Retrieved 2015-04-08. ^ Graubæk, Allan (2014-10-10). "Ny Tesla får brugt-salget til at eksplodere" [New Tesla makes second-hand sale explode]. Politiken. Archived from the original on 2015-02-14. Retrieved 2015-04-08. ^ Rydberg, Anders Vestergaard; Baunsgaard, Casper (June 2016). "Assessment of the Danish Car Market - With Emphasis on Consumer Behaviour" (PDF). Aarhus University, School of Business and Social Sciences. pp. 8–9. Archived from the original (PDF) on 2016-08-21. Retrieved 2016-08-12. ^ Lambert, Fred (2016-08-10). "Tesla victim of its own success in Denmark: 2 to 3 months wait for service, some owners are furious". Electrek. Retrieved 2016-08-11. ^ "Tesla eyes annual sales of 10,000 cars in Germany, Musk says". Automotive News Europe. Reuters. 2013-10-26. Retrieved 2013-11-02. ^ Kraftfahrt-Bundesamt (KBA) (December 2015). "Neuzulassungen von Personenkraftwagen nach Segmenten und Modellreihen im November 2015" [New registrations of passenger cars by segments and models in November 2015] (PDF) (in German). KBA. Retrieved 2015-12-16. [dead link] A total of 1,348 Model S sedans were registered in Germany between January and November 2015. ^ RAI (May 2014). "Nieuwverkoop Per Merk/Model" [New Sales By Brand / Model] (in Dutch). RAI Vereniging. Retrieved 2014-06-08. ^ Schiphol Group press release (2014-04-09). "Schiphol kiest voor duurzaam taxivervoer: Tesla" [Schiphol chooses sustainable taxi: Tesla] (in Dutch). Groen7.nl. Retrieved 2014-04-21. ^ "Cijfers elektrisch vervoer – Top 5 geregistreerde modellen plug-in hybride elektrische auto – Top 10 geregistreerde modellen volledig elektrische auto" [Figures electric transport – Top 5 registered plug-in hybrids – Top 10 registered fully electric vehicle models]. Rijksdienst voor Ondernemend Nederland (RVO) - Dutch National Office for Enterprising - (in Dutch). BovagWebsite. January 2017. Retrieved 2017-01-24. With a total of 25,984 Mitsubishi Outlander P-HEVs registered by the end of December 2016, the plug-in hybrid is the all-time top registered plug-in electric vehicle in the Netherlands. The Tesla Model S is the best selling all-electric car with 6,049 units registered. ^ Antony Ingram (2013-08-07). "First 2013 Tesla Model S Delivered Outside North America – In Oslo". Green Car Reports. Retrieved 2013-08-07. ^ "Rekordsalg av elbiler i august" [Record sales of electric cars in August] (in Norwegian). Grønn bil. 2013-09-02. Archived from the original on 2013-09-28. Retrieved 2013-09-04. ^ "Tesla's $110,000 Model S is now Norway's best-selling car". The Globe and Mail. Reuters. 2013-10-09. Archived from the original on 2013-10-10. Retrieved 2013-10-11. ^ Eric Loveday (2013-10-09). "Norwegians Buying "Used" Tesla Model S Sedans at Prices Higher Than New to Avoid 5-Month Wait". InsideEVs.com. Retrieved 2013-10-11. ^ "Nissan Leaf tops Norway Oct. car sales, beats Toyota Auris, VW Golf". Automotive News Europe. Reuters. 2013-11-01. Retrieved 2013-11-02. ^ OFV (2013-12-02). "Bilsalget i november OFV AS" [Car sales in August] (in Norwegian). Opplysningsrådet for Veitrafikken (OFV). Archived from the original on 2013-12-07. Retrieved 2013-12-31. ^ Mat Gasnier (2014-01-05). "Norway Full Year 2013: VW Golf No. 1, Nissan Leaf on podium!". Best Selling Cars Blog. Retrieved 2014-01-20. ^ Angelo Young (2013-12-13). "Tesla Owners in Norway Get $134,000 Tax Break, Which Is More Than The Base Price of the Model S". International Business Times. Retrieved 2014-01-04. ^ a b Ståle Frydenlund (2014-04-02). "Tesla knuste 28 år gammel rekord" [Tesla broke 28-year-old record] (in Norwegian). Norsk Elbilforening (Norwegian Electric Vehicle Association). Archived from the original on 2014-04-03. Retrieved 2014-04-03. ^ John D. Stoll (2014-04-02). "Tesla Breaks Norway's All-Time Sales Record". The Wall Street Journal. Archived from the original on 2014-04-07. Retrieved 2014-04-03. ^ Lambert, Fred (2016-07-05). "Tesla Model S deliveries down 52% in Norway during the second quarter". Retrieved 2017-07-08. ^ Pontes, Jose (2015-01-18). "Switzerland December 2014". EVSales.com. Retrieved 2015-02-08. ^ Automotive Industry Data (AID) (2015-08-25). "Switzerland's status-conscious rich dump conventional luxury saloons for Tesla's Green-Halo Model S". AID Newsletter. Retrieved 2015-08-26. ^ Neil Thomason (2015-01-21). "FleetPoint first impressions of the Tesla Model S". FleetPoint.org. Retrieved 2015-06-27. ^ Lambert, Fred (2016-09-08). "UK becomes Tesla's biggest European market, surpassing even Norway – for the moment". Electrotek. Retrieved 2016-09-10. ^ John Voelcker (2012-06-06). "First 2012 Tesla Model S Delivered To Earliest Depositor Steve Jurvetson (Video)". Green Car Reports. Retrieved 2012-06-06. ^ Cobb, Jeff (2015-07-06). "Tesla Model S Crosses 50,000 U.S. Sales Milestone". HybridCars.com and Baum & Associates. Retrieved 2015-07-06. A total of 49,720 Model S sedans had been sold in the U.S. through June 2015, of which, about 11,900 were sold during the first half of 2015. The 50,000 unit milestone was passed in early July 2015. ^ John Voelcker (2013-03-22). "Tesla Model S Update: 3,000th Electric Sedan Delivered In CA". Green Car Reports. Retrieved 2013-03-22. ^ Jay Cole (2013-03-22). "Tesla: Model S Production Now More Than 500 Per Week, Over 12 Million Total Miles Driven So Far". Inside EVs. Retrieved 2013-03-22. ^ Cobb, Jeff (2013-04-03). "March 2013 Dashboard". HybridCars.com and Baum & Associates. Retrieved 2013-04-07. ^ "Tesla likely Q1 US PEV leader with 4,750+ sales in North America; Nissan surges with LEAF in March in US". Green Car Congress. 2013-04-04. Retrieved 2013-04-07. ^ Vikas Shukla (2014-08-27). "Tesla's car comes with a 3G chip, so it can be tracked and shut down remotely". Value Walk. Retrieved 2014-08-29. ^ Jessica Caldwell (2013-10-31). "Drive by Numbers – Tesla Model S is the vehicle of choice in many of America's wealthiest zip codes". Edmunds.com. Retrieved 2013-11-02. ^ "Toyota Prius keeps Calif. sales crown; Tesla moves up". Automotive News. 2014-02-13. Retrieved 2014-02-16. ^ California New Car Dealers Association (CNCDA) (February 2014). "California Auto Outlook: Fourth Quarter 2013". Archived from the original on 2014-02-17. Retrieved 2014-02-16. ^ a b Hull, Dana (2014-01-29). "With a registration in Jackson, Mississippi, Tesla's Model S now has sales in all 50 states". SiliconBeat. Retrieved 2014-06-05. ^ a b Mark Rogowsky (2014-01-16). "Tesla Sales Blow Past Competitors, But With Success Comes Scrutiny". Forbes. Retrieved 2014-01-17. About 18,000 units were sold in the U.S. in 2013. ^ a b Cobb, Jeff (2015-01-06). "December 2014 Dashboard". HybridCars.com and Baum & Associates. Retrieved 2015-01-10. A total of 16,550 Model S sedans were sold in the U.S. in 2014. See section "December 2014 Battery Electric Car Sales Numbers"
^ Cobb, Jeff (2016-01-06). "December 2015 Dashboard". HybridCars.com and Baum & Associates. Retrieved 2016-01-08. ^ Cobb, Jeff (2015-10-06). "Tesla Model S is America's Best-Selling Plug-in Car This Year". HybridCars.com and Baum & Associates. Retrieved 2015-10-06. ^ California New Car Dealers Association (CNCDA) (February 2016). "California New Vehicle Registrations Expected to Remain Above 2 Million Units in 2016" (PDF). Archived from the original (PDF) on February 17, 2016. Retrieved November 24, 2016. Registrations through December 2015 since 2011. Revised figures for 2014. ^ Randall, Tom (2016-10-12). "Tesla Dominates U.S. Luxury Sedan Sales". Bloomberg. Retrieved 2016-10-14. ^ California New Car Dealers Association (CNCDA) (February 2017). "State New Vehicle Market Up Slightly in 2016; Similar Outlook for 2017" (PDF). Retrieved 2017-02-24. Registrations through December 2016 since 2012. Revised figures for 2015. ^ Murphy, Tom (2017-01-18). "New 5-Series Arrives as BMW U.S. Sales Fall". Ward's. Retrieved 2017-01-24. ^ Loveday, Eric (2017-06-19). "Tesla Model S Sales Surpass 100,000 in U.S." InsideEVs.com. Retrieved 2017-08-04. ^ Loveday, Eric (2017-06-23). "Tesla Model S Sales Hit 100,000 In U.S. Quicker Than Chevy Volt, Nissan LEAF". InsideEVs.com. Retrieved 2017-08-04. ^ a b California New Car Dealers Association (CNCDA) (February 2018). "New Vehicle Registrations in State Predicted to Exceed 2 Million Units Again in 2018" (PDF). CNCDA. Retrieved 2018-02-17. ^ Baker, David R. (2018-02-28). "Top-selling electric car in California is not a Tesla". San Francisco Chronicle. Retrieved 2018-03-04. ^ Mosendz, Polly (2016-07-13). "What Happens When You Die Waiting for a Tesla?". Bloomberg. Retrieved 2016-07-30. ^ Ingram, Antony (2013-12-03). "Tesla Wins Vs Ohio Car Dealers, Amendment Defeated". Green Car Reports. Retrieved 2013-12-03. ^ Voelcker, John (2013-06-21). "New York Auto Dealers Try To Make Registering Tesla Stores Illegal". Green Car Reports. Retrieved 2013-12-17. ^ "Where can Tesla sell cars?". Mojo Motors, Inc. 2015-03-19. Archived from the original on 2015-07-08. Retrieved 2015-07-07. ^ Tani, Maxwell (2015-05-21). "Texas says no to Tesla direct sales". Business Insider. Retrieved 2015-07-07. ^ Hutchinson, Lee (2015-05-21). "Bill to allow Tesla to sell cars in Texas dies in committee". Ars Technica. Retrieved 2015-07-08. ^ "List of Tesla Stores, Service Centers and Chargers". teslamotors.com. Retrieved 2015-07-07. ^ "Official Tesla Model S 2014 safety rating results". EURO NCAP. 2014. Retrieved 2016-08-16. ^ "2014 Tesla Model S 5 HB RWD". NHTSA. 2014. Retrieved 2016-08-16. ^ "Model S Achieves Euro NCAP 5-Star Safety Rating". Tesla Motors. 2013-11-05. Retrieved 2014-11-26. ^ "2013 Tesla Model S 5 HB RWD". U.S. Department of Transportation. Retrieved 2014-10-25. ^ "Official Tesla Model S 2014 safety rating results". Euro NCAP. Retrieved 2016-05-07. ^ a b Kilgore, Tomi; Assis, Claudia (2017-07-06). "Tesla no longer biggest U.S. car company by market cap as stock plunges briefly into bear-market territory". MarketWatch. Retrieved 2017-07-06. ^ "Two electric cars miss IIHS awards". IIHS. 2017-02-01. Retrieved 2017-07-07. ^ a b c Christopher Jensen (2013-10-02). "Tesla Says Car Fire Started in Battery". The New York Times. Retrieved 2013-10-05. ^ a b c Steven Russolillo (2013-10-04). "Musk Explains Why Tesla Model S Caught on Fire". The Wall Street Journal. Retrieved 2013-10-05. ^ Phillipe Crowe (2013-10-04). "Tesla Model S Catches Fire". HybridCars.com. Retrieved 2013-10-05. ^ Voelcker, John (2013-10-03). "First Tesla Model S Fire Caused By Collision With Road Debris". Green Car Reports. Retrieved 2014-10-23. ^ 2012–2013 Model S Emergency Response Guide (PDF). Tesla Motors. 2013. p. 18. Retrieved 2014-10-23. If the high voltage battery becomes involved in fire or is bent, twisted, damaged, or breached in any way, or if you suspect that the battery is heating, use large amounts of water to cool the battery. DO NOT extinguish fire with a small amount of water. Always establish or request an additional water supply. ^ David Shepardson (2013-10-24). "U.S. will not open investigation into Tesla fire". The Detroit News. Archived from the original on 2013-10-29. Retrieved 2013-10-25. ^ a b Bill Vlasic and Jaclyn Trop (2013-11-19). "After 3 Fires, Safety Agency Opens Inquiry into Tesla Model S". The New York Times. Retrieved 2013-11-24. ^ Eric Loveday (2013-11-19). "NHTSA Opens Formal Investigation into 13,108 Model Year 2013 Tesla Model S Sedans Sold in US (Update)". InsideEVs.com. Retrieved 2013-11-24. ^ Danielle Ivory (2014-03-28). "Federal Safety Agency Ends Its Investigation of Tesla Fires". The New York Times. Retrieved 2014-03-31. ^ Trop, Jaclyn (2013-11-07). "Another Fire Raises Questions for Tesla". The New York Times. Retrieved 2013-11-10. ^ Voelcker, John (2013-11-19). "Tesla Fires: NHTSA Will Probe, Warranty To Cover Fire Damage, Ride-Height Tweak". Green Car Reports. Retrieved 2013-11-24. ^ Lopez, Linette (2014-02-13). "Another Tesla Caught on Fire While Sitting in a Toronto Garage This Month". Business Insider. Retrieved 2014-02-16. ^ Ohnsman, Alan (2014-02-14). "Tesla Investigating Cause of Fire in Toronto With Model S". Bloomberg News. Retrieved 2014-02-16. ^ George, Patrick (2014-03-28). "The Tesla Model S: Now With Road Debris-Crushing Titanium!". Jalopnik. Retrieved 2014-03-31. ^ Blanco, Sebastian (2014-03-28). "Tesla adds free titanium underbody shields to Model S to prevent fires". Autoblog Green. AOL Inc. Archived from the original on 2014-03-30. Retrieved 2014-03-31. ^ Roelsgaard, Peter (2016-01-01). "Norsk Tesla bryder i brand under opladning" [Norsk Tesla ignites during charging]. Ekstra Bladet (in Norwegian). Retrieved 2016-01-02. ^ Hopland, Sindre (2016-01-02). "Tesla tok fyr under hurtiglading" [Tesla caught fire while supercharging]. NRK Sørlandet (in Norwegian). Retrieved 2016-01-02. ^ George, Patrick (2016-01-01). "Tesla Model S Burns to a Crisp During Supercharging in Norway". Jalopnik. Retrieved 2016-01-02. ^ a b Hattrem, Hanne; Larsen-Vonstett, Øystein (2016-03-17). "Tesla-brannen: Kortslutning i bilen, men vet ikke hvorfor" [Tesla fire: Short circuit in the car but do not know why]. Verdens Gang (in Norwegian). Retrieved 2016-03-18. ^ Lambert, Fred (2016-02-14). "Tesla Supercharger Fire: Authorities are shutting down the investigation and report indications that the fire originated in the car". Electrek. Retrieved 2016-03-18. ^ Lambert, Fred (2016-03-17). "Tesla will update the Model S software for safer charging following a Supercharger fire". Electrek. Retrieved 2016-03-18. ^ "Teslas Are Not More Prone To Fire Than Other Cars, Says NTSB Investigator". The Inquisitr. 2018-07-16. Retrieved 2018-07-23. ^ "Tesla Model S Achieves Best Safety Rating of Any Car Ever Tested" (Press release). Tesla Motors. 2013-08-19. Retrieved 2013-09-01. ^ Ashlee Vance (2013-08-20). "Tesla's Model S Sedan Destroys Safety Tests ... Literally". Bloomberg Businessweek. Retrieved 2013-09-01. ^ Jerry Hirsch (2013-08-20). "Upstart Tesla wins top U.S. safety rating; what will competitors do?". Los Angeles Times. Retrieved 2013-09-01. ^ Alan Ohnsman (2013-08-20). "Tesla Says Model S Sedan Receives Top U.S. Crash Rating". Bloomberg News. Retrieved 2013-09-01. ^ Mark Rogowsky (2013-08-20). "Safest Car on the Road: Even Crashing Into A Wall Is Good News For Tesla". Forbes. Retrieved 2013-09-01. ^ Cheryl Jensen (2013-08-21). "How Does Tesla's 5-Star Safety Rating Inform Overall Vehicle Safety?". The New York Times. Retrieved 2013-09-01. ^ Jason Siu (2013-08-22). "Tesla Model S is NOT the Safest Car Ever, Say Feds". Auto Guide. Retrieved 2013-09-01. ^ "Update: Tesla roof so strong it broke crush-test machine". USA Today. 2013-08-21. Retrieved 2013-09-01. ^ a b Wattles, Jackie (2018-03-30). "Tesla recall: 123,000 Model S cars may have a steering problem". CNN. US. Retrieved 2018-04-04. ^ "Tesla Model S Recalls". Cars.com. 2013-06-14. Retrieved 2017-04-21. ^ "Tesla Model S Recalls". Cars.com. 2014-01-13. Retrieved 2017-04-21. ^ "Tesla Recalling All Model S Sedans to Check for Seat Belt Defect". NBC News. 2015-11-20. Retrieved 2015-11-21. ^ "Model S seat belt inspection". Tesla Motors. Retrieved 2015-11-24. ^ Lambert, Fred (2017-01-17). "Tesla to start replacing passenger airbags in all 2012 Model S sedans due to industry-wide Takata recall". Electrek. Retrieved 2017-01-17. ^ Lee, Timothy B. (2016-06-10). "Tesla's real problem isn't that its cars are expensive. It's that they're unreliable". Vox. Retrieved 2017-04-21. ^ Lee, Timothy B. (2017-04-20). "Tesla is recalling most of the cars it sold in 2016". Vox. Retrieved 2017-04-21. ^ "Tesla Model S Named 2013 AutoGuide.com Reader's Choice Car of the Year". AutoGuide. 2012-12-12. Retrieved 2012-12-28. ^ "And Now There Is One.... Tesla Model S Declared 2013 World Green Car". International Business Times. PR Newswire. 2013-03-28. Archived from the original on 2013-05-24. Retrieved 2013-03-28. ^ Zenlea, David (2012-11-01). "2013 Automobile of the Year: Tesla Model S". Automobile Magazine. Retrieved 2012-11-01. ^ Cunningham, Wayne; Goodwin, Antuan (2012-12-19). "2012 Car Tech Awards: And the winner is..." CNET. Retrieved 2012-12-24. ^ Mark Rechtin. "Tesla Model S P85D Breaks the Consumer Reports Ratings System". Consumer Reports. ^ Jamie Butters and Alan Ohnsman (2013-01-21). "Tesla Model S Tops Consumer Reports Survey of Owners". Bloomberg News. Retrieved 2013-11-24. ^ Stephen Edelstein (2014-12-04). "Tesla Model S Tops Consumer Reports Customer Satisfaction Index, Again". Green Car Reports. Retrieved 2014-12-07. ^ Cobb, Jeff (2014-02-25). "Consumer Reports: Tesla Model S 'Best Overall' 2014 Top Pick". HybridCars.com. Retrieved 2014-02-26. ^ "2015 Tesla Model S P85D". consumerreports.org. ^ Voelcke, John (2012-12-10). "2013 Tesla Model S: Green Car Reports' Best Car To Buy 2013". Green Car Reports. Retrieved 2012-12-28. ^ "Tesla Model S: Greatest car of the 2010s | Hagerty Articles". Retrieved 2018-07-23. ^ MacKenzie, Angus (2013-01-01). "2013 Motor Trend Car of the Year: Tesla Model S". Motor Trend. Retrieved 2012-11-12. ^ Natural Resources Canada (2013-02-14). "2013 ecoENERGY for Vehicles Awards" (Press release). Natural Resources Canada. Retrieved 2013-02-22. ^ "Auto Grand Award Winner: Tesla Model S". PopSci. 2012-11-01. Retrieved 2012-11-19. ^ "The top 10 cars that changed the world (and one that's about to)". The Daily Telegraph. 2014-12-21. Retrieved 2014-12-29. ^ Chris Knapman (2014-12-21). "Tesla Model S: the most important car of the last 20 years". The Daily Telegraph. Retrieved 2014-12-29. ^ "Best Inventions of the Year 2012 – $22,000 – $750,000 -The Tesla Model S". Time. 2012-11-01. Archived from the original on 2012-11-03. Retrieved 2012-11-02. ^ della Cava, Marco R. (2012-10-31). "Tesla Model S: The 2013 Yahoo! Autos Car of the Year". Yahoo! Autos. Retrieved 2013-01-19. ^ Phillips, Drew (2015-04-28). "AAA ranks Tesla Model S P85D best green car of 2015, Versa is best value". Auto Blog. Retrieved 2015-05-12. ^ Snyder, John Beltz (2014-06-24). "AAA says Tesla Model S is the best green car available". Auto Blog. Retrieved 2015-05-12. ^ Liptak, Andrew (2017-08-06). "Italian Tesla drivers set distance record after driving Model S 670 miles on a single charge". The Verge. Retrieved 2017-08-30. ^ Muoio, Danielle (2017-06-22). "Two Tesla fanatics just drove a Model S for a record 560 miles on a single charge -- here's how". Business Insider. Australia. Retrieved 2017-08-30. ^ Andersen, Ina (2015-08-26). "Norske Bjørn kjørte 728 kilometer i en Tesla – på én lading" [Norwegian Bjorn ran 728 kilometers in a Tesla - on a single charge]. Teknisk Ukeblad (in Norwegian). Retrieved 2016-06-22. ^ "Longest Trip In A Production Electric Car: Tesla Model S P85D breaks Guinness World Records record". World Record Academy. 2015-08-27. Retrieved 2016-06-22. ^ Metcalf, David; Metcalf, Adam (2012-12-13). "World Record Father-Son Drive" (Press release). Tesla Motors. Retrieved 2016-06-22. ^ Motavalli, Jim (2012-12-12). "Father and Son Drive 423 Miles on One Charge in Tesla Model S". The New York Times. Retrieved 2016-06-22. ^ Musk, Elon (2012-05-09). "Model S Efficiency and Range". Tesla Motors. Retrieved 2014-10-11. ^ Broder, John (2013-02-10). "Stalled Out on Tesla's Electric Highway". The New York Times. Retrieved 2013-02-16. ^ Musk, Elon (2013-02-13). "A Most Peculiar Test Drive". Tesla Motors. Retrieved 2013-02-16. ^ Broder, John (2013-02-14). "That Tesla Data: What It Says and What It Doesn't". The New York Times. Retrieved 2013-02-16. ^ Peter Valdes-Dapena (2013-02-15). "Test drive: DC to Boston in a Tesla Model S". CNN Money. Retrieved 2013-02-16. ^ Philip LeBeau (2013-02-19). "Behind the Wheel, Putting the Tesla to the Test". CNBC. Retrieved 2013-02-22. ^ Elvia Thompson (2013-02-18). "Tesla Model S Road Trip: Electric Cars Make It From DC To CT". Green Car Reports. Retrieved 2013-02-20. ^ Sebastian Blanco (2013-02-18). "Tesla Model S road trip drivers find success along NYT's failed drive route [w/video]". Autoblog Green. Retrieved 2013-02-20. ^ Margaret Sullivan (2013-02-18). "Problems With Precision and Judgment, but Not Integrity, in Tesla Test". The New York Times. Retrieved 2013-02-20. ^ James Poniewozik (2013-03-04). "Charged Debate". Time. Retrieved 2013-02-22. ^ "After a Charging System Test, a Debate Erupts Online". The New York Times. 2013-02-22. Retrieved 2013-02-22. ^ "E-Auto-Härtetest auto motor und sport unterstreicht harte Testmethoden" [car auto motor und sport emphasizes hard test methods]. Auto motor und Sport. Retrieved 2014-11-12. ^ "Tesla S im Nachtest 258 km Reichweite bei 120 km/h und 13 Grad" [Tesla S at posttest reaches 258 km at 120 km / h, 13 degrees]. Auto motor und Sport. 2014-09-12. Retrieved 2014-11-12. ^ Meiners, Jens (2014-08-28). "Beim dritten Gasstoß fängt der Tesla an zu schwächeln" [By the third step on the pedal the Tesla starts to weaken]. Die Welt. Retrieved 2014-11-12. ^ "Tesla Model S Homepage". Archived from the original on 2010-01-14. Retrieved 2017-04-18. ^ "Yet Another Delay for Telsa Motors – Model S Coming in 850 Days or So, Maybe". 2010-01-15. Retrieved 2017-04-18. ^ Nolan, David (2013-11-25). "Life With Tesla Model S: Even After Update, Vampire Draw Remains". Green Car Reports. Retrieved 2013-11-25. ^ Rechtin, Mark (2015-10-20). "Tesla Reliability Doesn't Match Its High Performance". Consumer Reports. Retrieved 2015-11-24. ^ "2013 Tesla Model S Long-Term Wrap-Up | Edmunds.com". Edmunds. Retrieved 2016-04-05. ^ "Tesla Model S Critical Backlash: Five Main Problems With Electric Car Identified In Recent Reviews". International Business Times. Retrieved 2016-04-05. ^ Christian Seabaugh (2015-10-28). "2015 Tesla Model S P90D w/Ludicrous Upgrade First Test". Motor Trend. ^ "Model S - Tesla Motors". teslamotors.com. Archived from the original on 2015-03-11. ^ Quiroga, Tony (2015-01-30). "2015 Tesla Model S P85D". Car and Driver. Archived from the original on 2016-05-23. Retrieved 2016-12-12. ^ a b Ronan Glon (2015-09-29). "Owners Question Tesla P85D Power Output". Digital Trends. ^ Sarah Shelton (2015-09-29). "What Is The Actual Overall Horsepower Rating for the Tesla P85D?". HybridCars.com. ^ a b JB Straubel. "Tesla All Wheel Drive (Dual Motor) Power and Torque Specifications" Tesla, September 21, 2015. Quote: "only this (single or combined) motor shaft horsepower rating that is legally required to be posted in the European Union." ^ "Uniform provisions concerning the approval of internal combustion engines or electric drive trains intended for the propulsion of motor vehicles of categories M and N with regard to the measurement of net power and the maximum 30 minutes power of electric drive trains" pages 9+41. United Nations Economic Commission for Europe, August 21, 2013. Quote: "5.3.1.2. The net power test shall consist of a run at full setting of the power controller." "Note: If the battery limits the maximum 30 minutes power, the maximum 30 minutes power of an electric vehicle can be less than the maximum 30 minutes power of the drive train of the vehicle according to this test." ^ Nathan Morris. "Keep Your Engine Alive: The Importance of Oil Temperature". Tuner University. ^ Jim Koscs. "Engine Horsepower – Muscle Car Horsepower". Hagerty Insurance Agency. ^ Aaron Severson (2008-04-15). "Understanding Gross Versus Net Horsepower Ratings". Ate Up With Motor. ^ "Model S – Tesla Motors". teslamotors.com. Archived from the original on 2015-11-02. ^ Ramsdal, Roald (2016-12-06). "Tesla mener P85D-kjøperne tok "en risiko for skuffelse, som de selv må bære"". Teknisk Ukeblad. Retrieved 2016-12-12. ^ "Tesla settles Norway lawsuit over car's performance". Reuters. 2016-12-12. Retrieved 2016-12-12. ^ Zolfagharifard, Ellie (2016-05-27). "A Tesla Model S with autopilot and cruise control activated crashes van". Daily Mail Online. UK. Retrieved 2016-06-02. ^ "Model S Owner's Manual" (PDF). Tesla Motors. pp. 60–61. Archived from the original (PDF) on 2015-03-19. Retrieved 2016-06-01. ^ Lambert, Fred (2016-05-30). "Google Deep Learning Founder says Tesla's Autopilot system is 'irresponsible'". Electrek. 9to5 Network. Retrieved 2016-06-01. ^ "Be prepared for these roadblocks if you want to drive a Tesla in Singapore | Stuff". www.stuff.tv. Retrieved 2016-06-01. ^ "LTA on Tesla: CO2 emissions for electric cars start at power grid". Channel NewsAsia. Retrieved 2016-06-01. ^ "Gas Mileage of 2014 Tesla Model S". www.fueleconomy.gov. Retrieved 2016-06-01. ^ a b c "Here's how clean a Model S is in Singapore (and elsewhere)". Tesla Motors. Retrieved 2016-06-01. ^ hermes (2016-03-04). "Electric car Tesla slapped with $15,000 tax surcharge". The Straits Times. Retrieved 2016-06-01. ^ "Singapore's LTA says the Tesla Model S it tested was a used car, hence its low efficiency". Tech in Asia. 2016-03-10. Retrieved 2016-06-01.
van Gilluwe, Frank (2013). Tesla Model S - Best Car Ever! (1st. ed.). FAQware. ISBN 978-0-9860689-0-4. See book review: "Tesla Model S Best Car Ever!" is the Book All Model S Owners Should Own (Book Review)". InsideEVs. 2013-12-13. Howe, Nick J. (2014). Owning Model S: The Definitive Guide to Buying and Owning the Tesla Model S (1st. ed.). See book review: "Owning A Tesla Model S: New Book Offers Tips, Tricks, Inside Info (Book Review)". Green Car Reports. 2017-05-27. Wikimedia Commons has media related to Tesla Model S.
Should Battery Fires Drive Electric Cars Off the Road?, Scientific American, November 12, 2013.